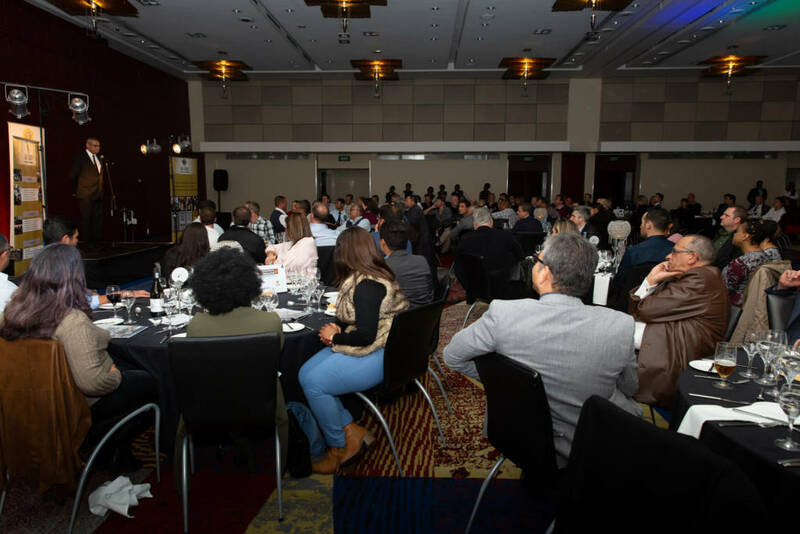 With skills development and high youth unemployment being contentious issues in post-apartheid South Africa, most prevalent of the concerns are aspects that adequately prepare youth for employment. 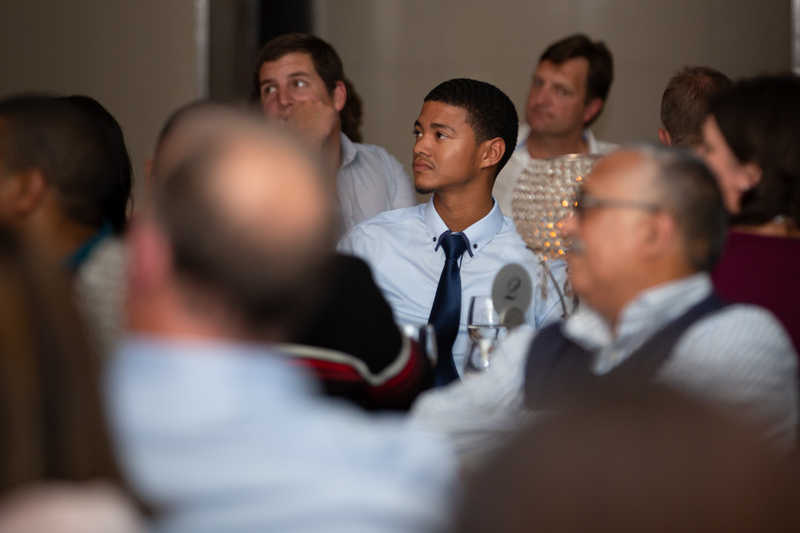 Youth, especially from marginalised communities need support more than before, particularly in Maths and Science subjects in order to support future career aspirations. 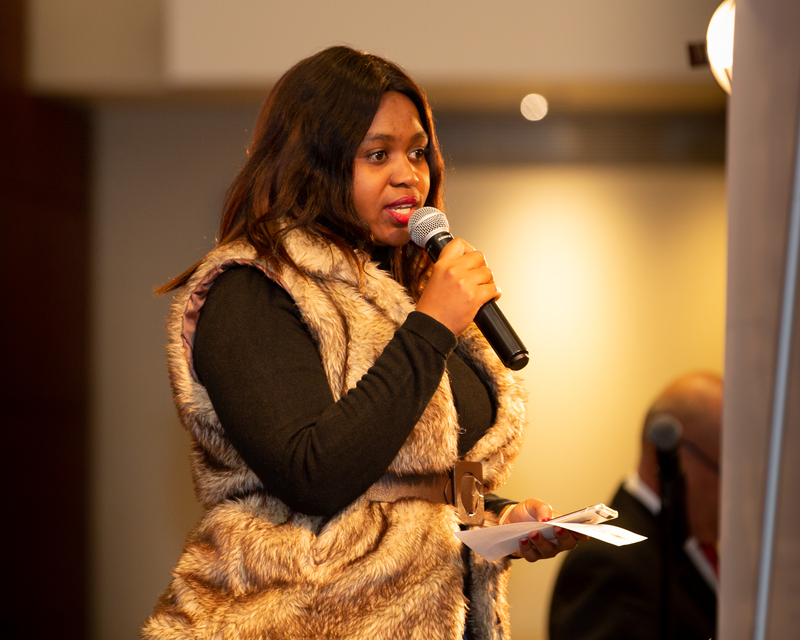 Challenges however continue for our youth beyond the schooling environment because of the difficulty accessing opportunities to study further and qualify for employment. 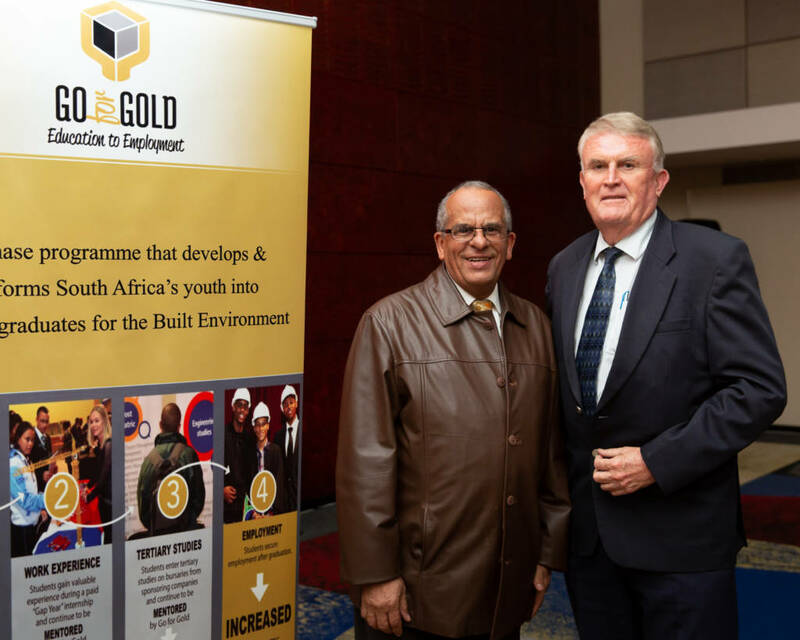 Work readiness programmes such as the Go for Gold Education-to-Employment programme is creating opportunities and providing a stable framework for youth development, particularly for youth interested in pursuing technical vocations in the South African built environment. 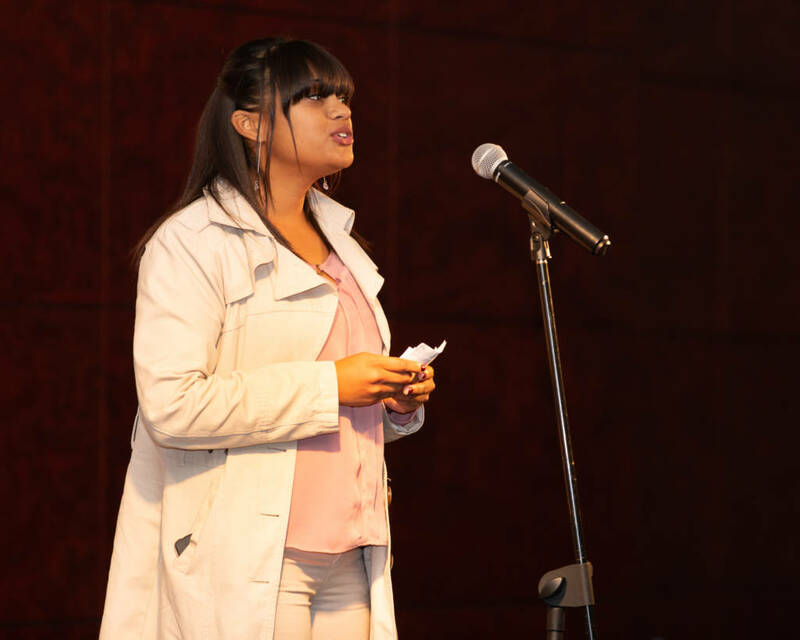 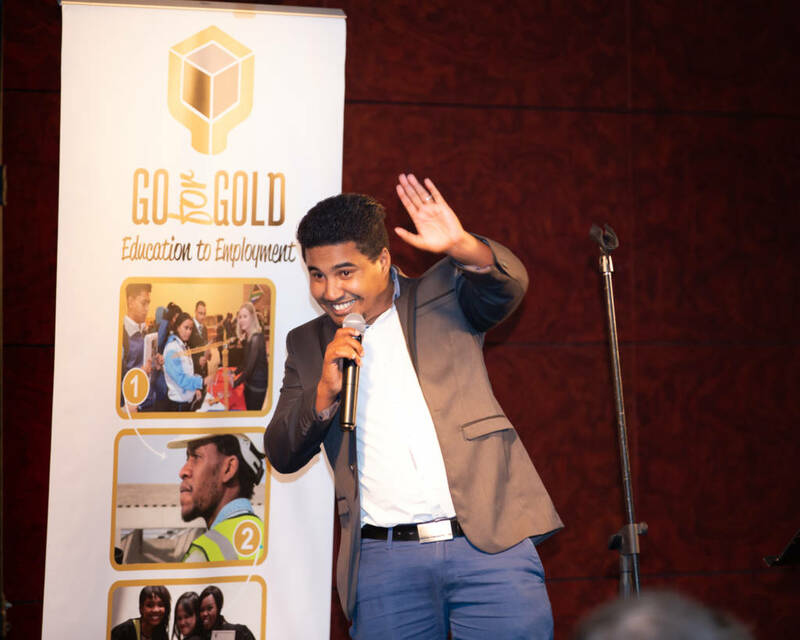 The Go for Gold programme is proof that collaboration between private and civil society is proving to make a difference for youth in their communities and is testimony that structured initiatives addressing each stage of a young person’s development can impact poverty and change South Africa for the better. 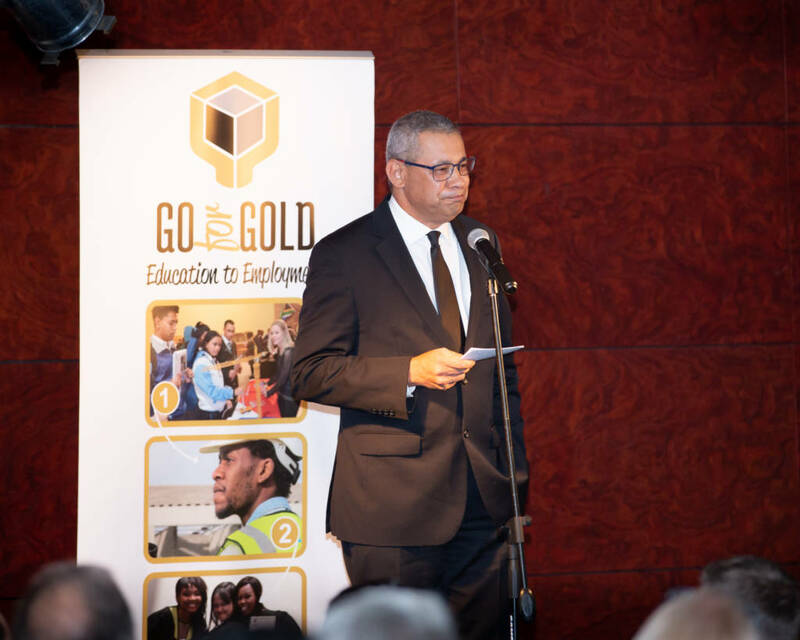 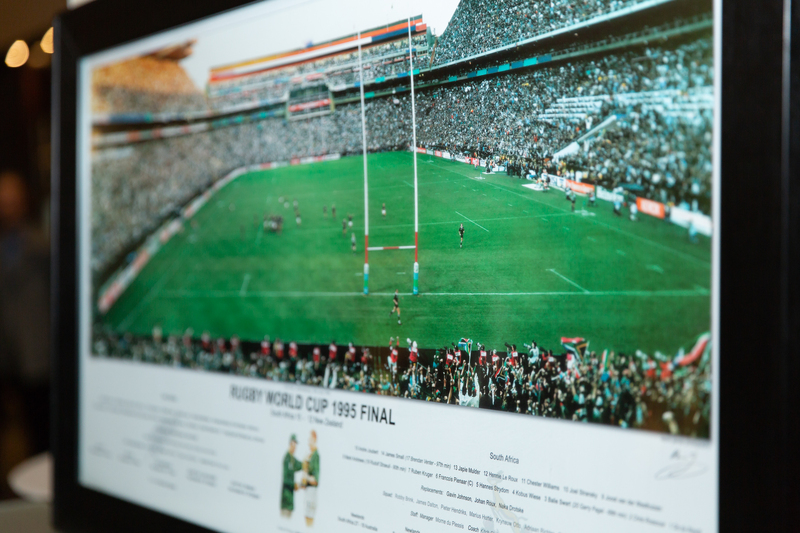 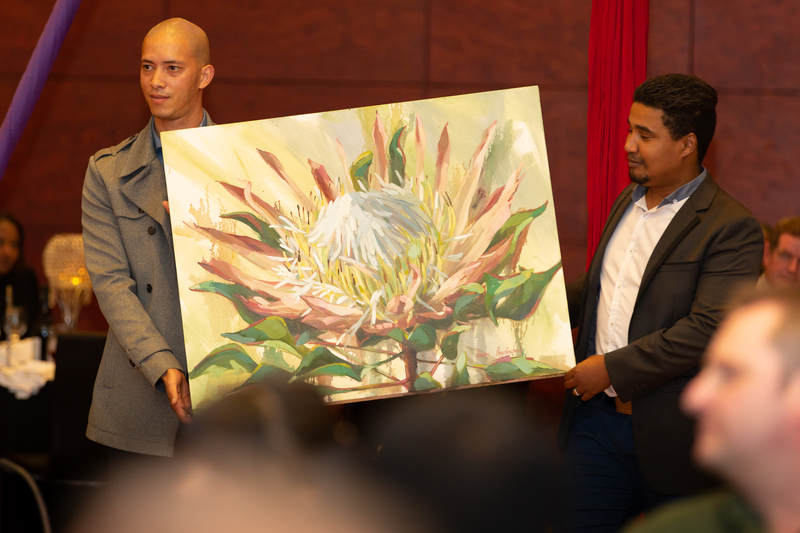 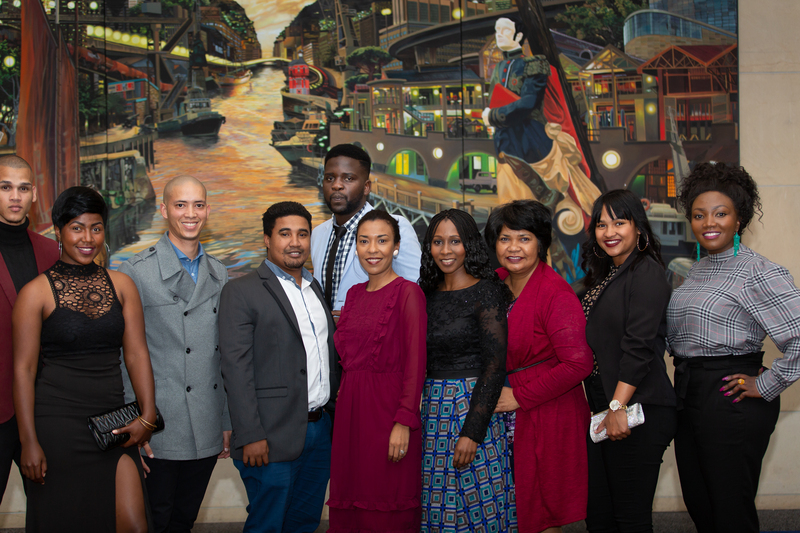 Go for Gold is an award-winning ‘education-to-employment’ public-private initiative, founded in 1999 through a collaboration between companies in the Built Environment, the South African Department of Education and civil society. 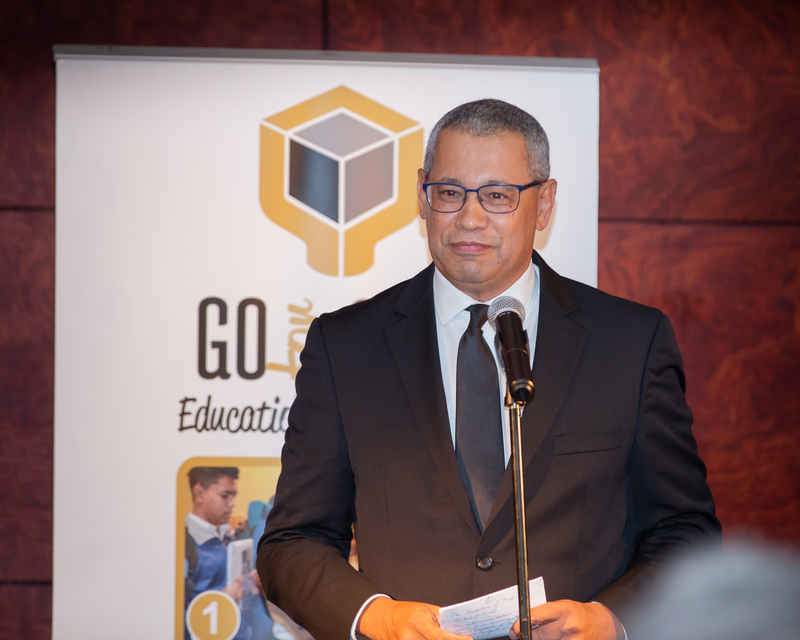 It was created to directly improve the number of young people, from disadvantaged communities, eligible to study towards a technical profession and then secure employment in the built environment and related industries. 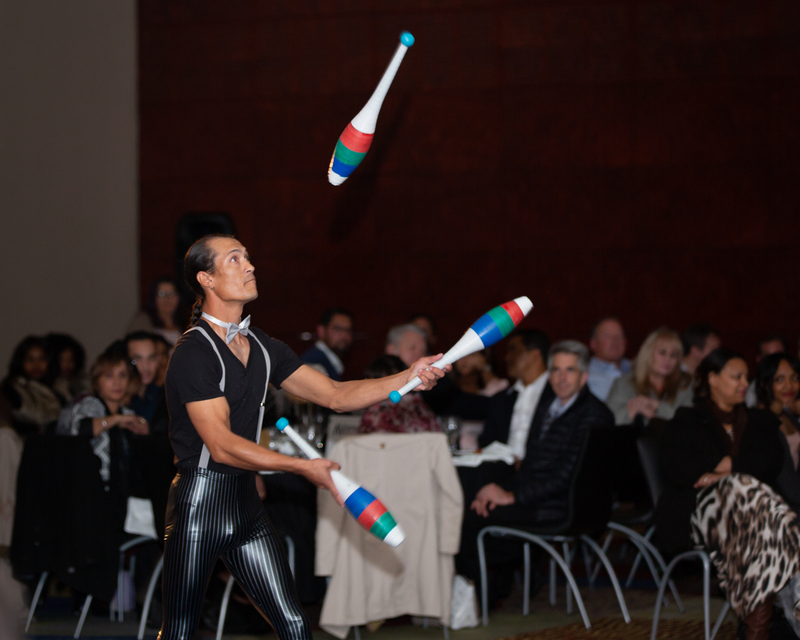 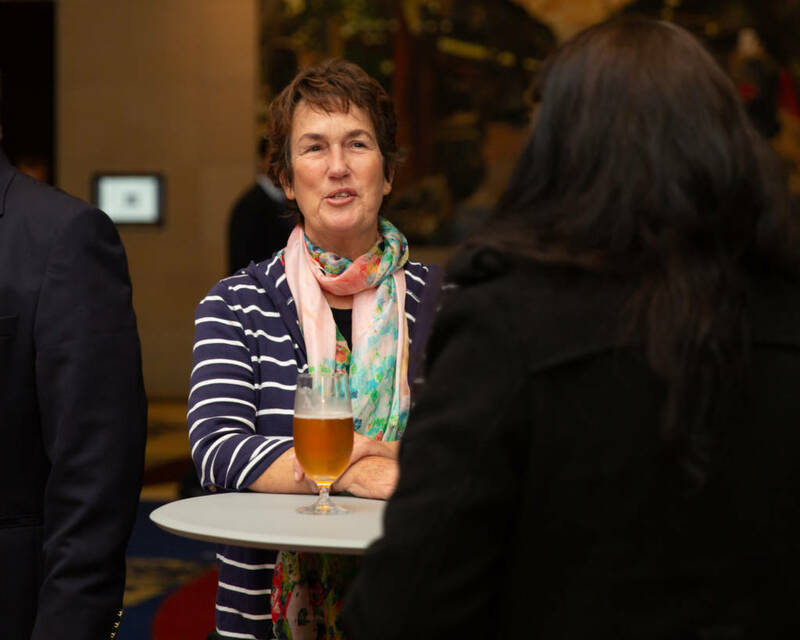 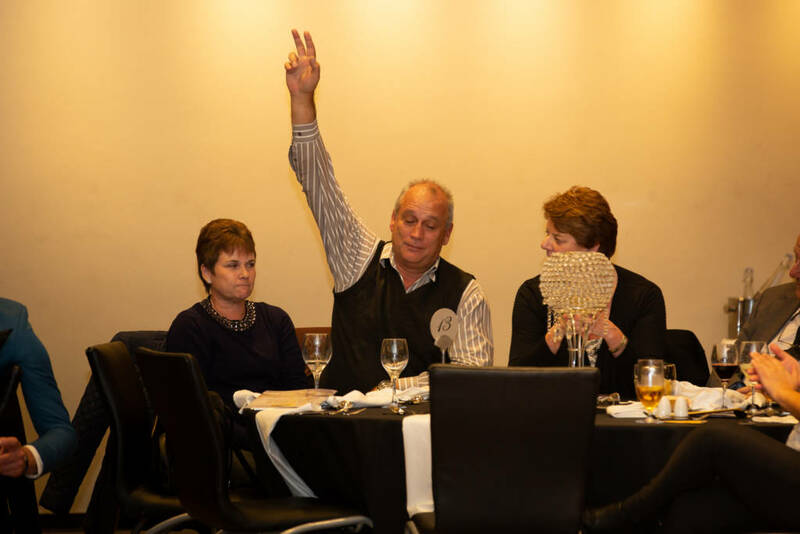 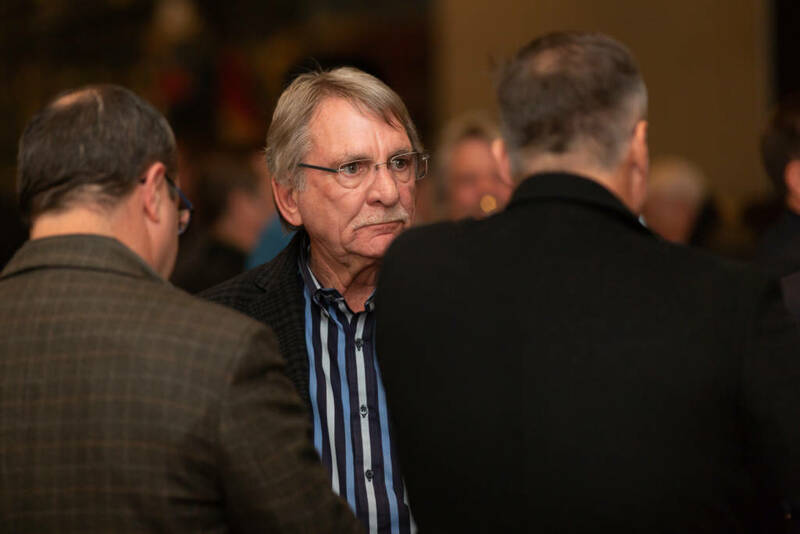 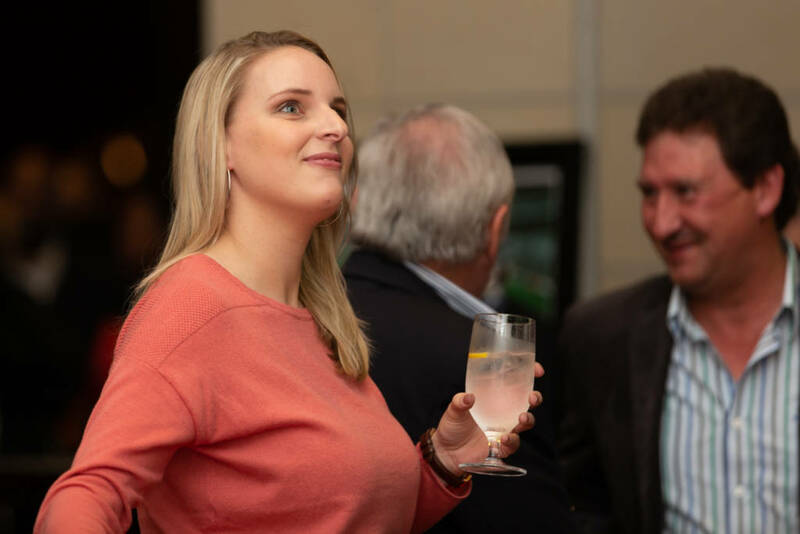 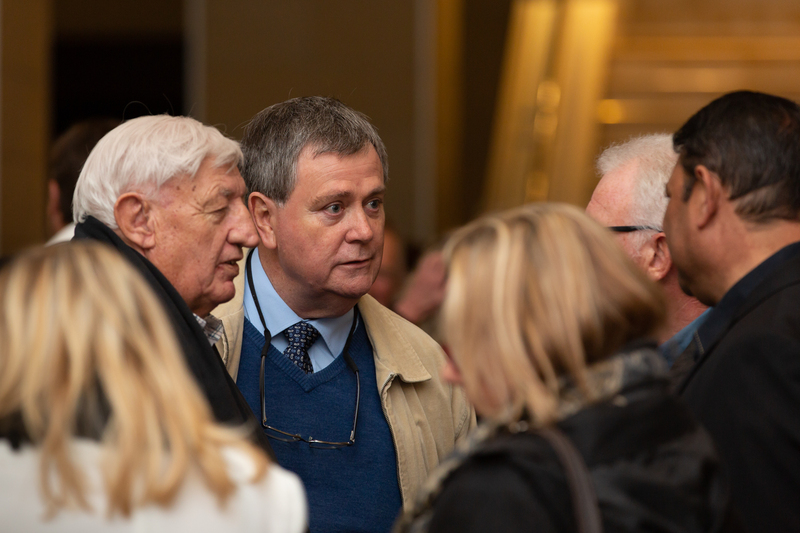 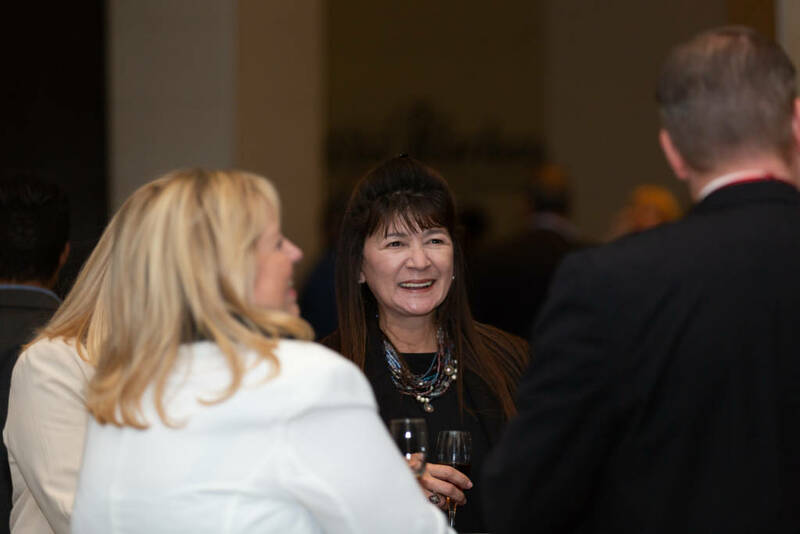 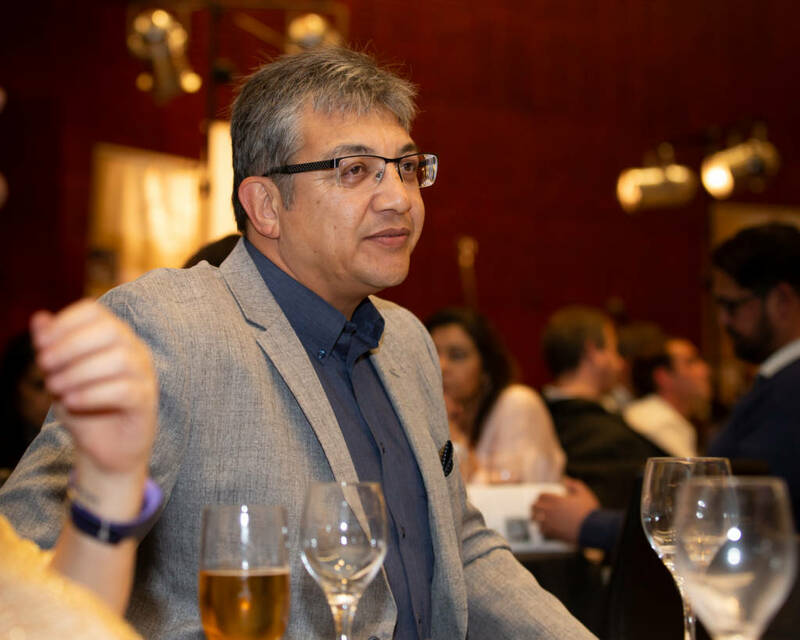 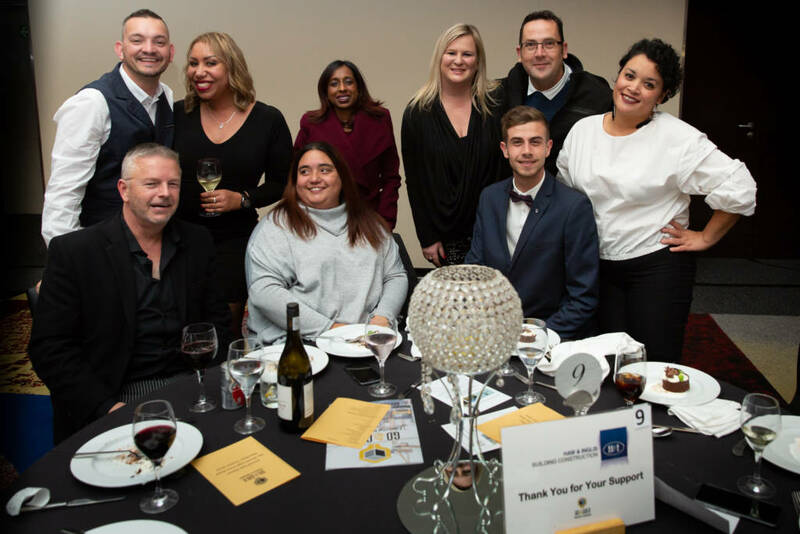 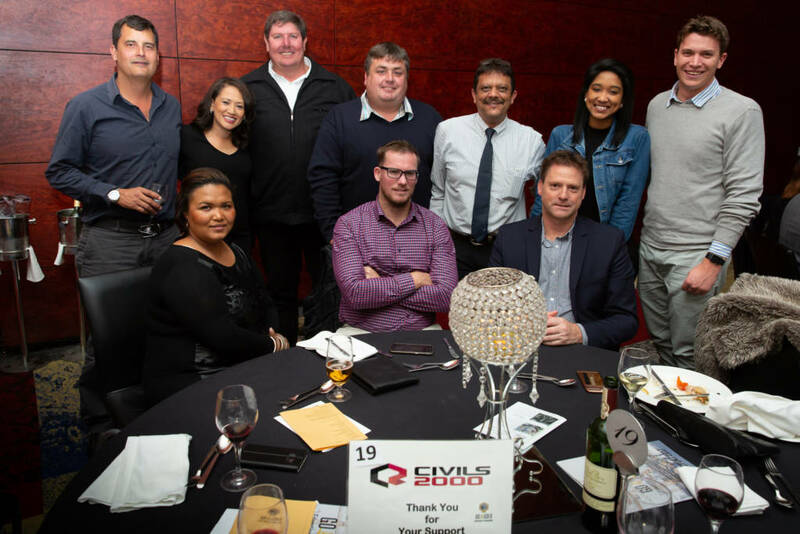 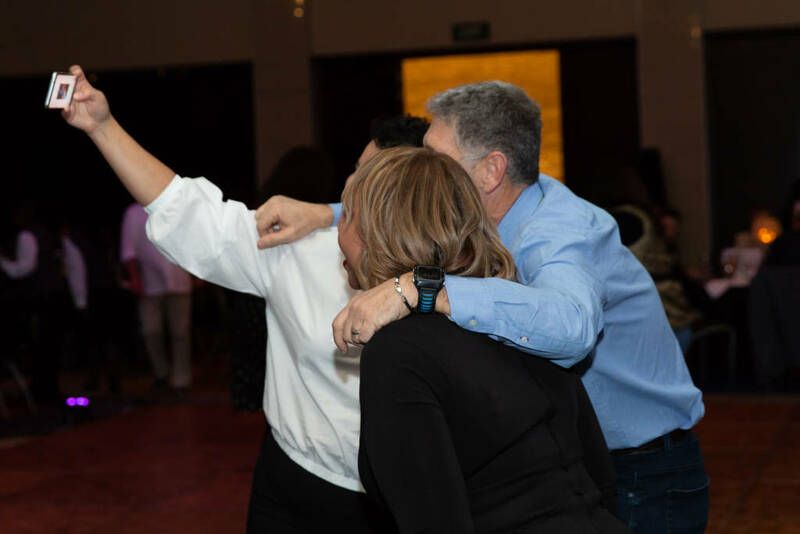 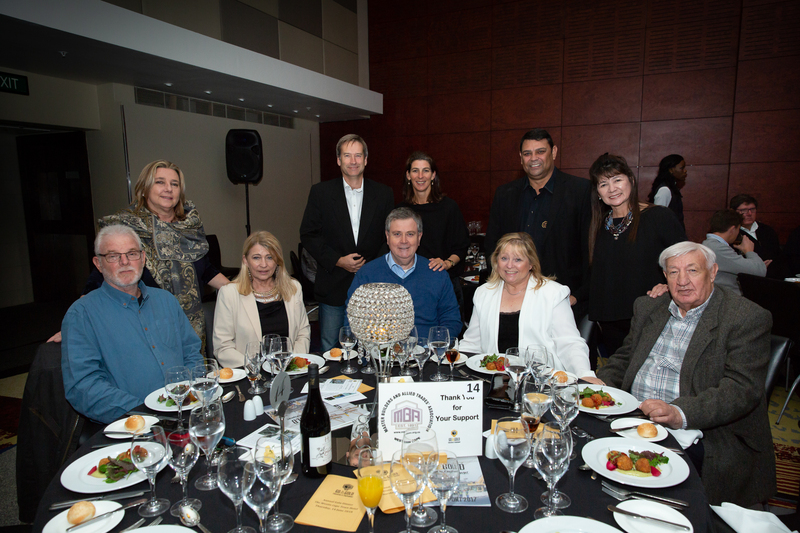 Each year Go for Gold celebrate industry participation and garner support for their beneficiaries at the Go for Gold Fundraising Dinner and Auction. 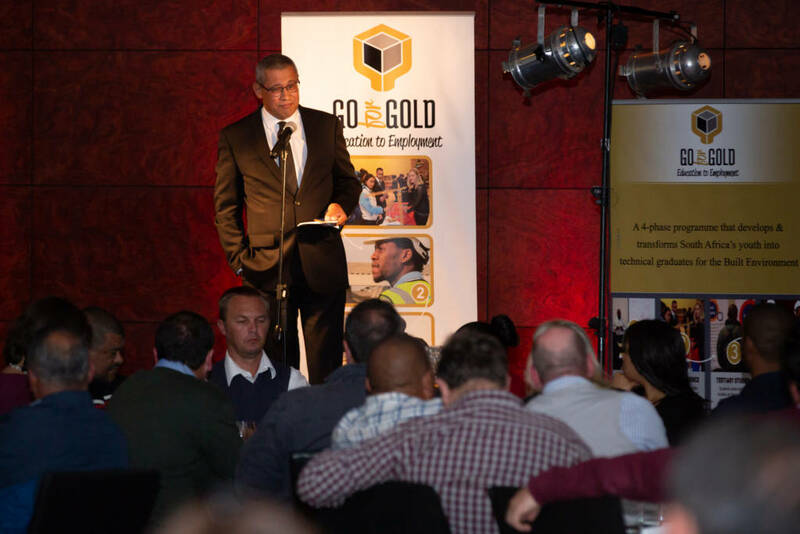 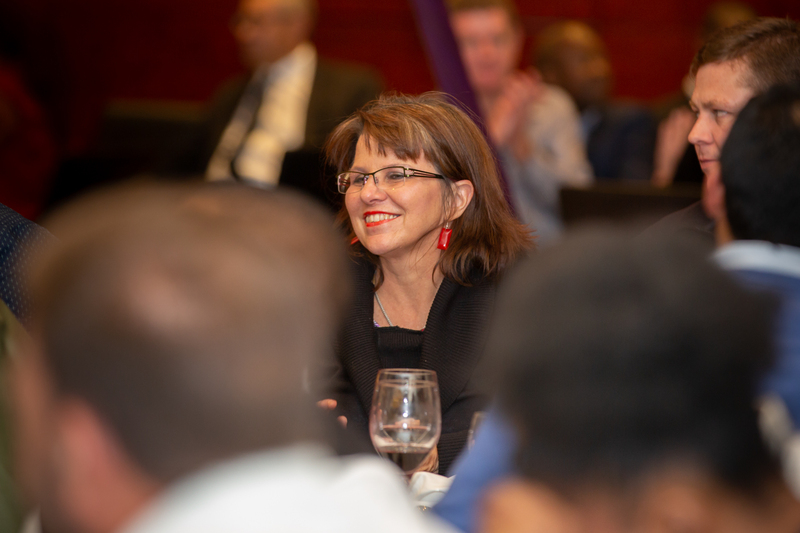 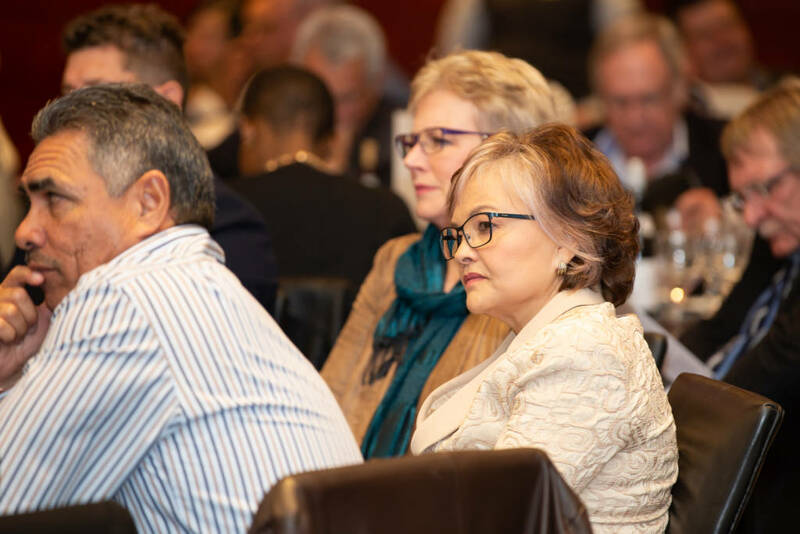 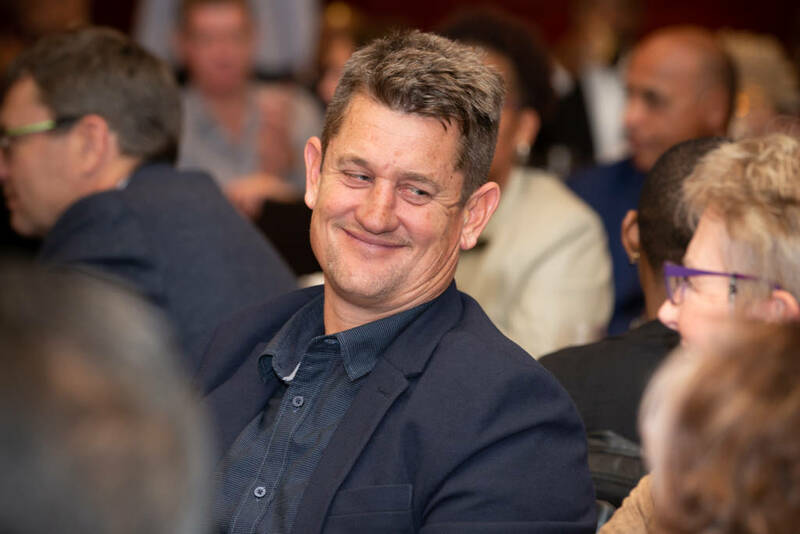 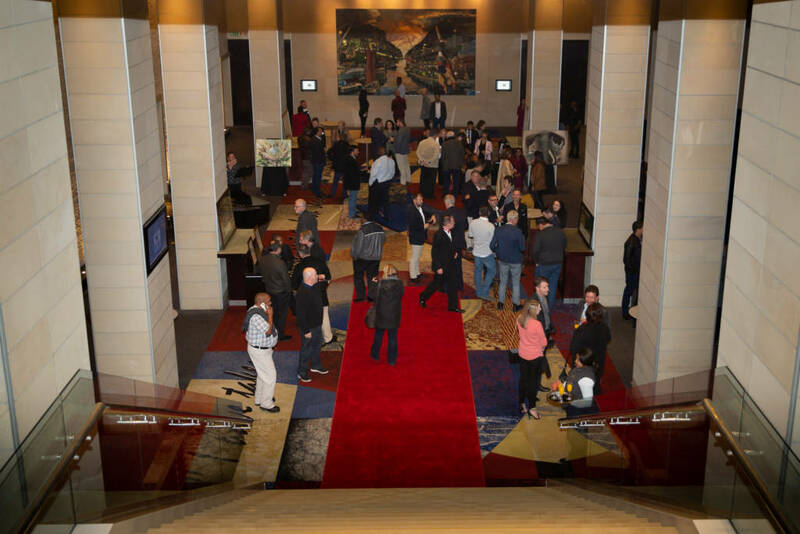 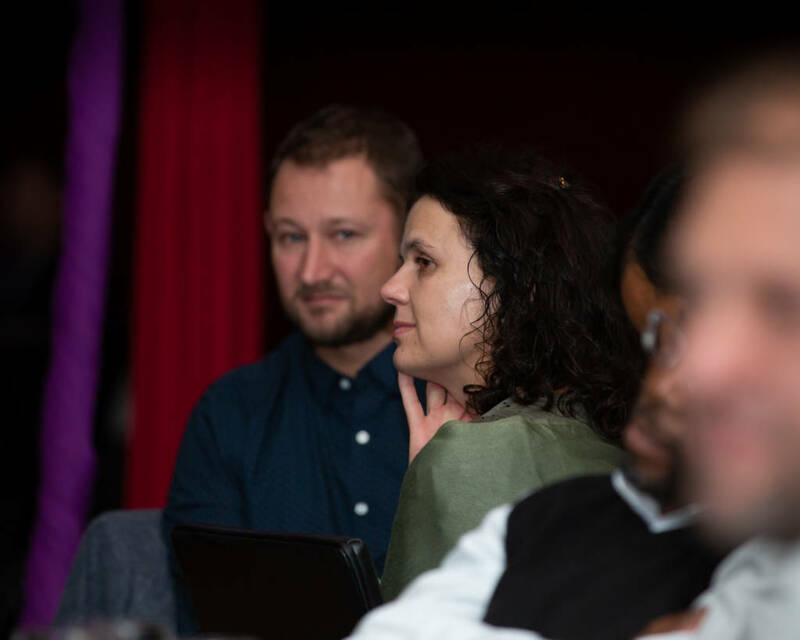 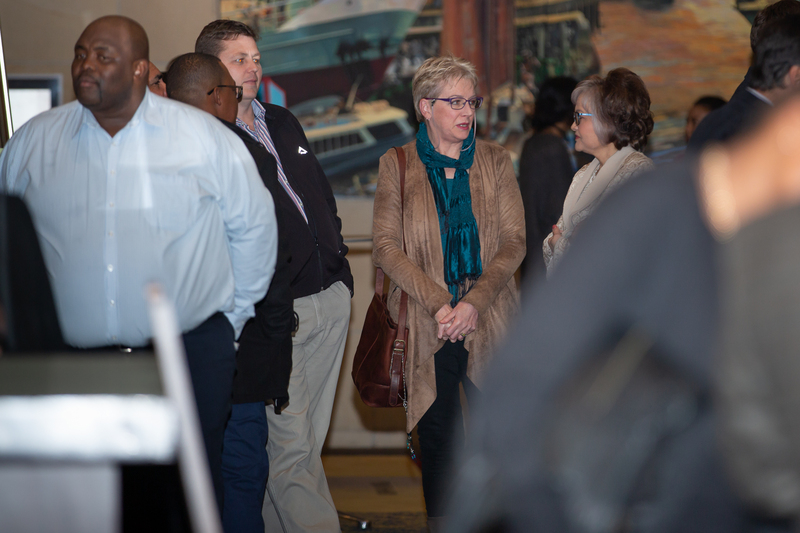 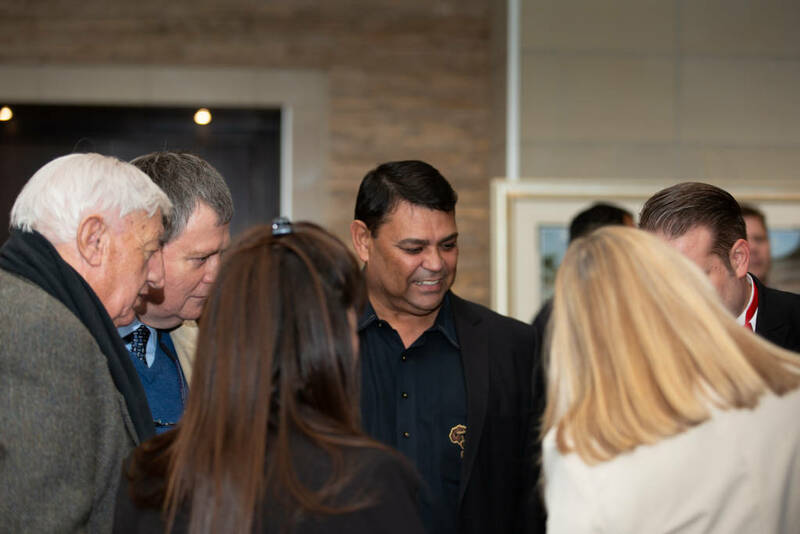 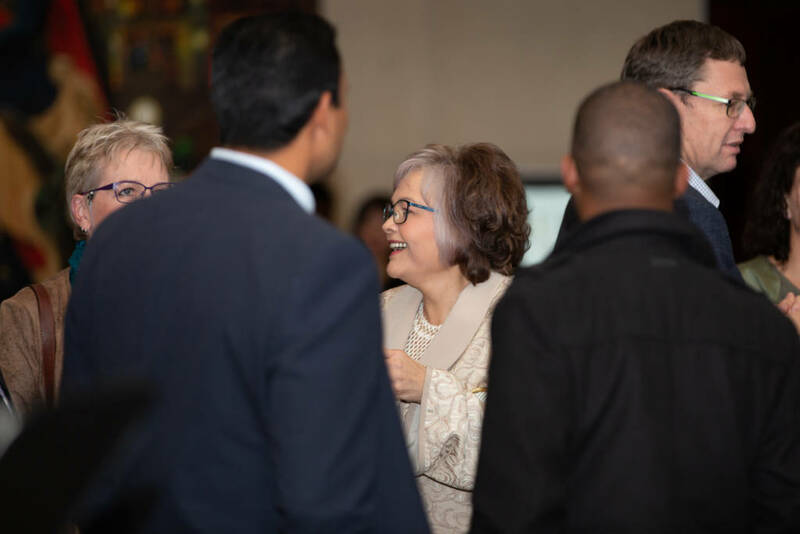 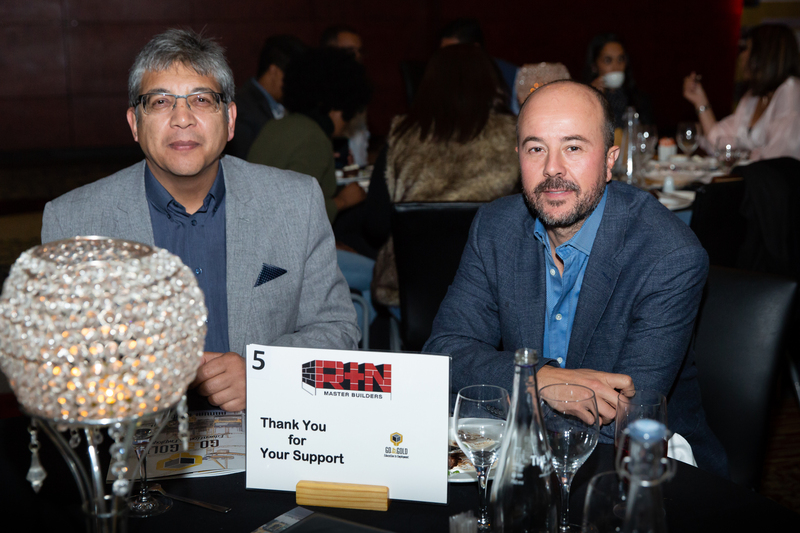 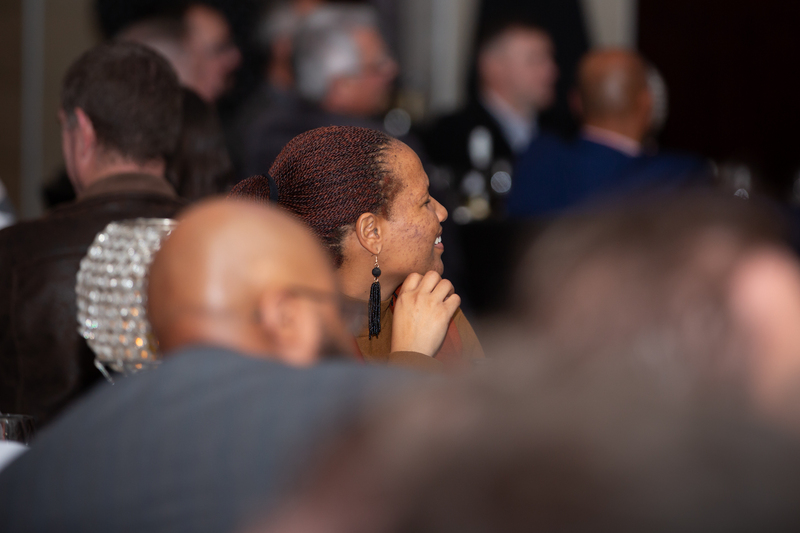 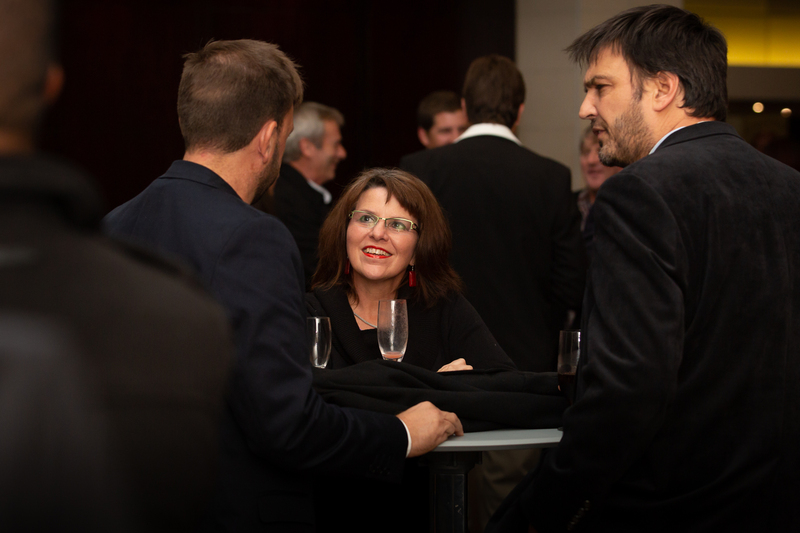 It is an annual event boasting attendance by Go for Gold partner companies all of whom are major players from the South African Build Environment; many of whom have supported the 4 phase Education-to-Employment programme since 2005. 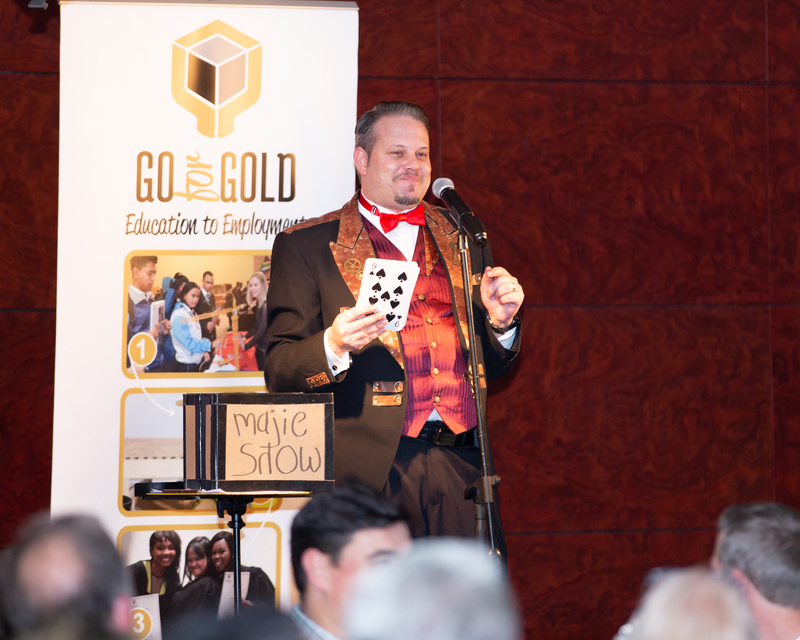 Go for Gold partners support youth on each of the 4 phases of career development. 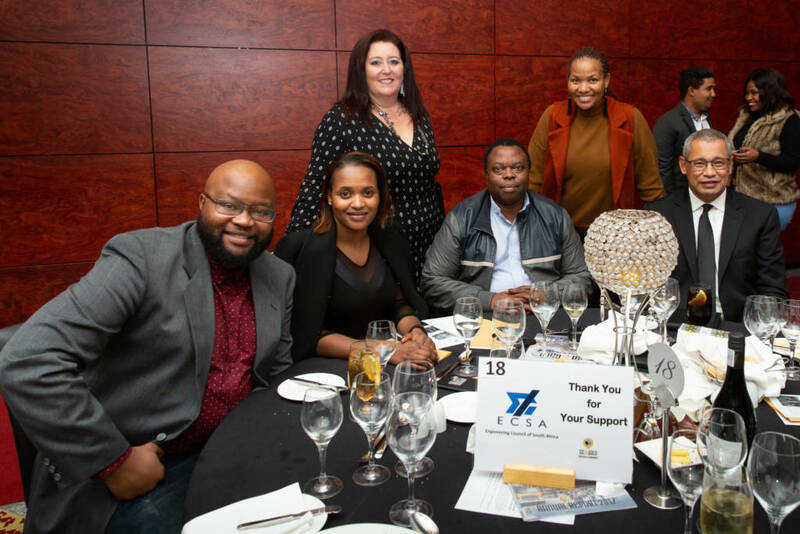 The supportive journey begins when Go for Gold beneficiaries are in Phase 1, their Grade 11 and 12 year where Go for Gold provide students with Maths and Science tuition, Leadership Development training and provide exposure to careers at Go for Gold partner companies. 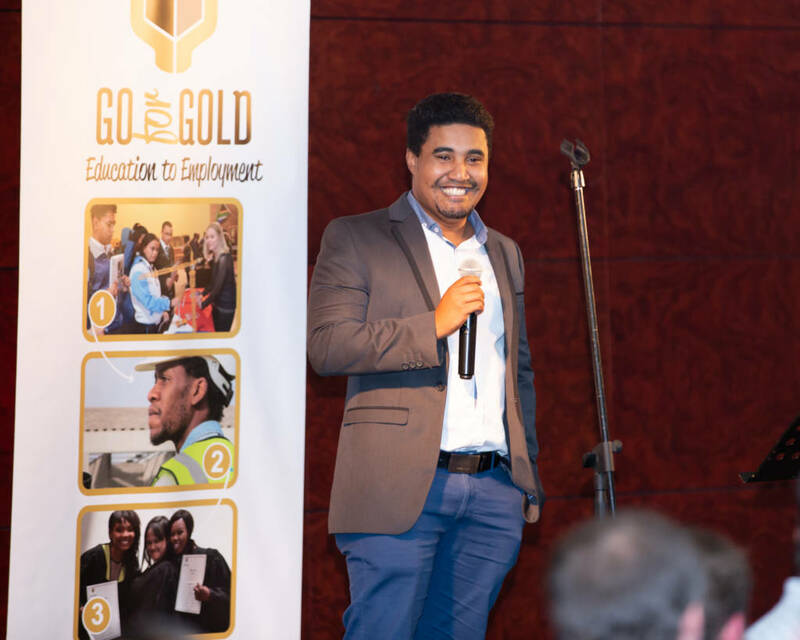 Partner companies sponsor unemployed youth to receive the benefits that Go for Gold provides to these students. When the students are in Grade 12, partner company HR Managers interview students for placement at their company for an experiential internship at their company in Phase 2 (post schooling gap year). The benefit of the Phase 2 year is that it allows youth to work at Go for Gold partner companies for a year, receive a general workers salary and on weekends attend bridging classes in Maths and Science to better prepare them for tertiary-level Maths and Science subjects. 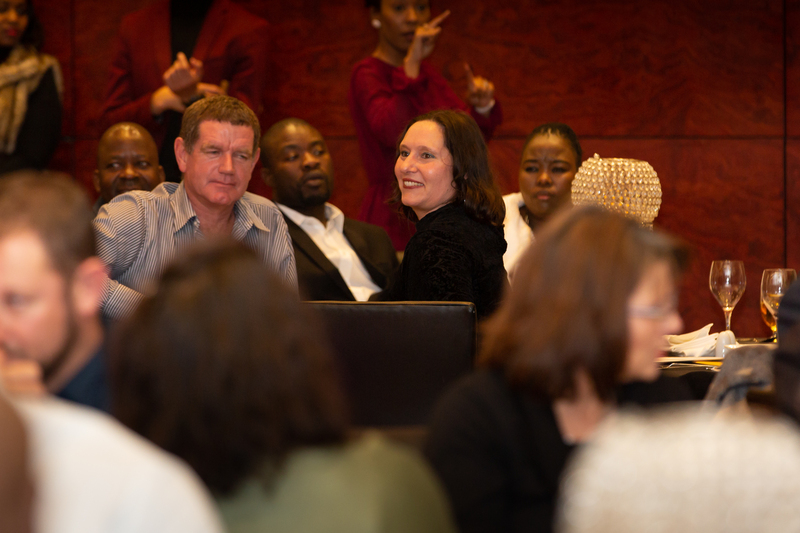 The Phase 2 year allows beneficiaries to accurately choose their course of study, based on practical exposure they experienced in this year. 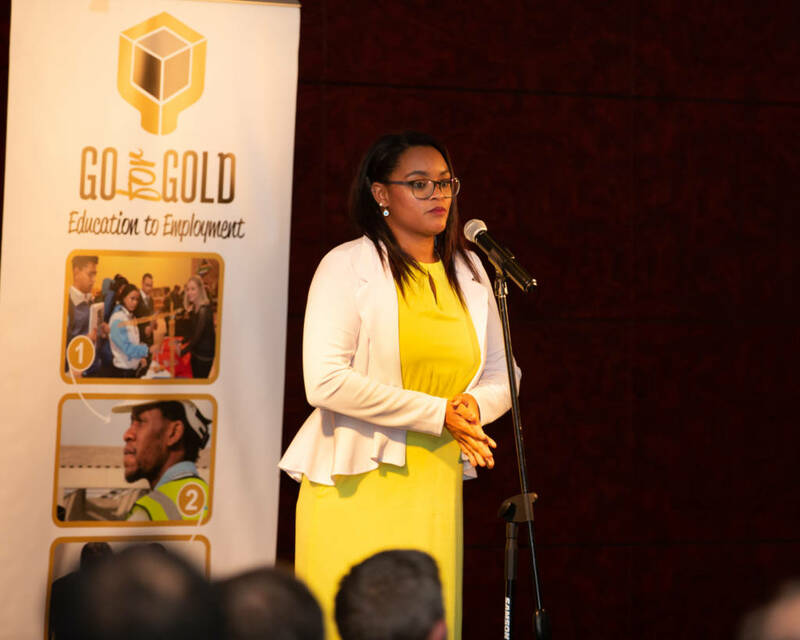 The Go for Gold Phase 2 year was recently recognized at the “Africa Talks Conference” organised by NEPAD where Go for Gold’s Fundraising and Communications Manager, Karen Rademeyer presented the Education-to-Employment model to 55 African Union states in Addis Ababa. 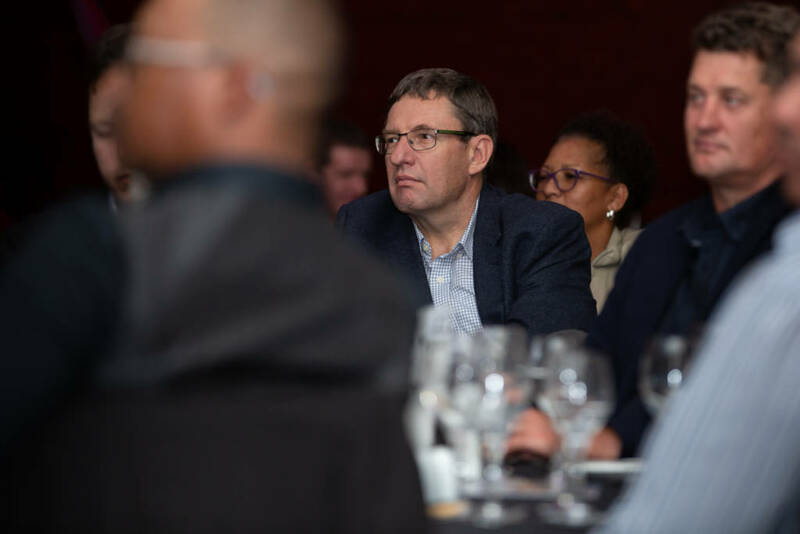 Concerns at the conference highlighted the non-preparedness of youth to choose a course of study, often failing first years at tertiary institutions and wasting bursary investments. 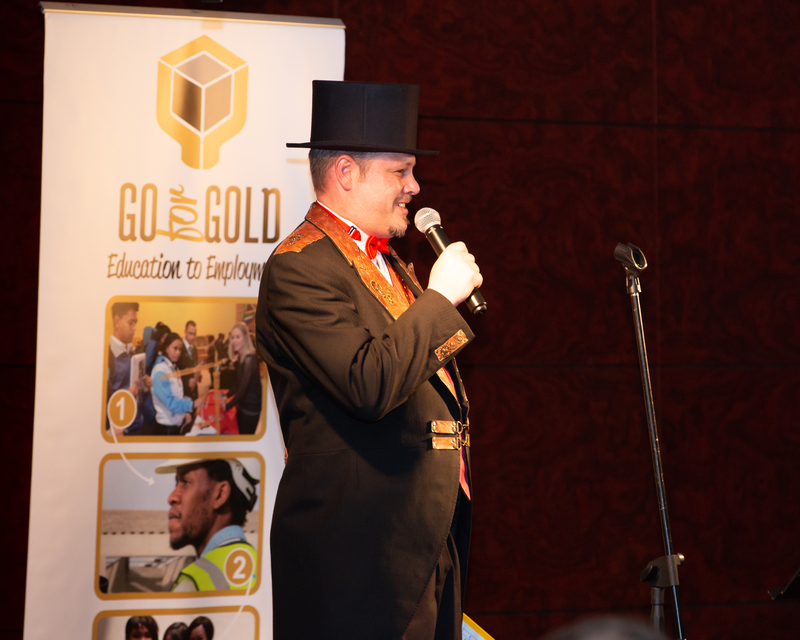 Go for Gold was able to share their 4-phased approach to youth development which yielded great interest from conference attendees. 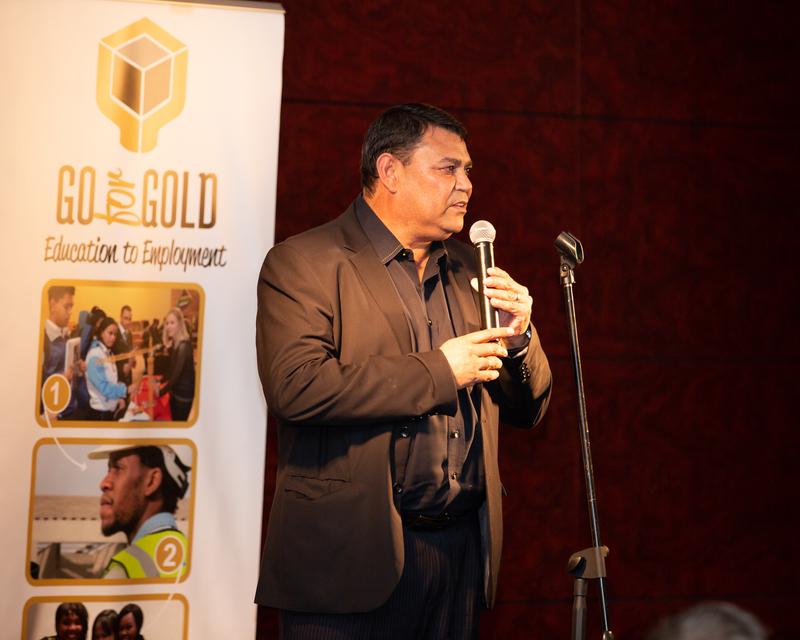 Go for Gold was able to highlight that the benefits for the Phase 2 year also extended to Go for Gold partner companies who enjoyed Go for Gold strengthening their bursary investments with the bridging classes in Maths and Science and allowing companies to invest in youth they have already worked with. 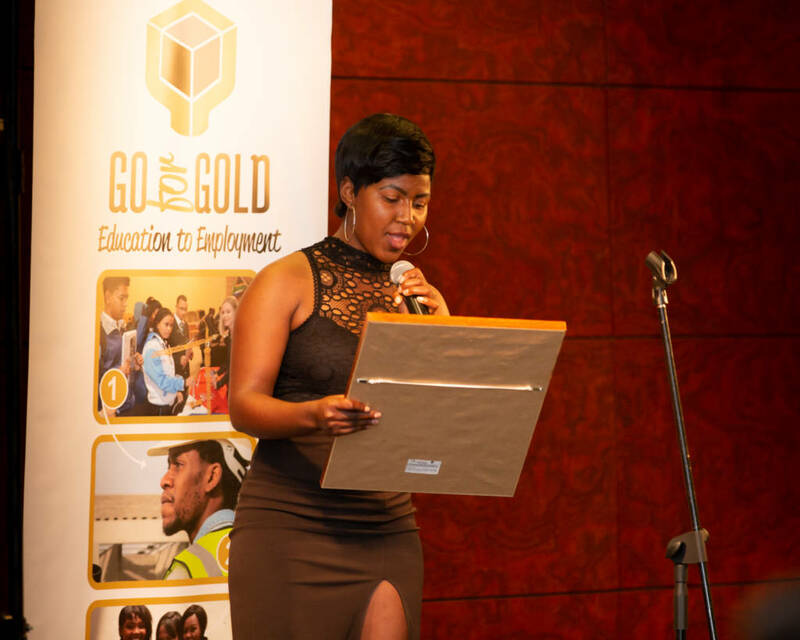 The remaining Go for Gold phases include tertiary studies in Phase 3 and qualified technical graduates returning to partner companies in Phase 4 for employment. 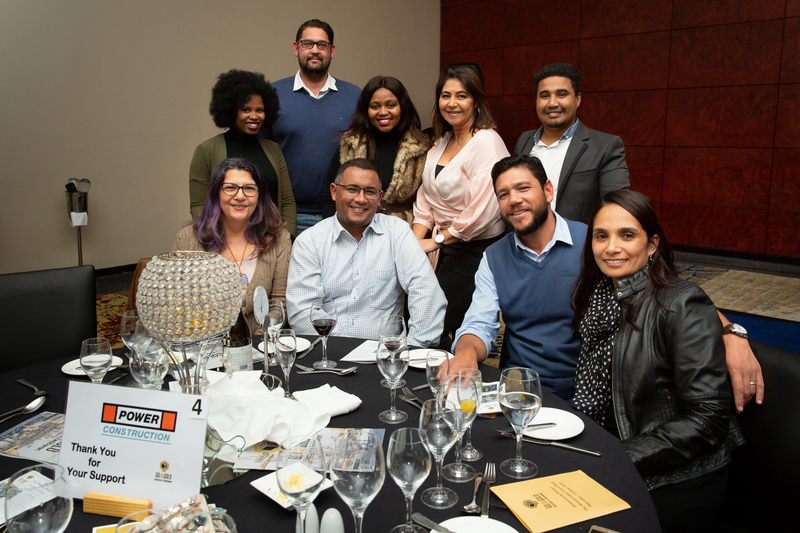 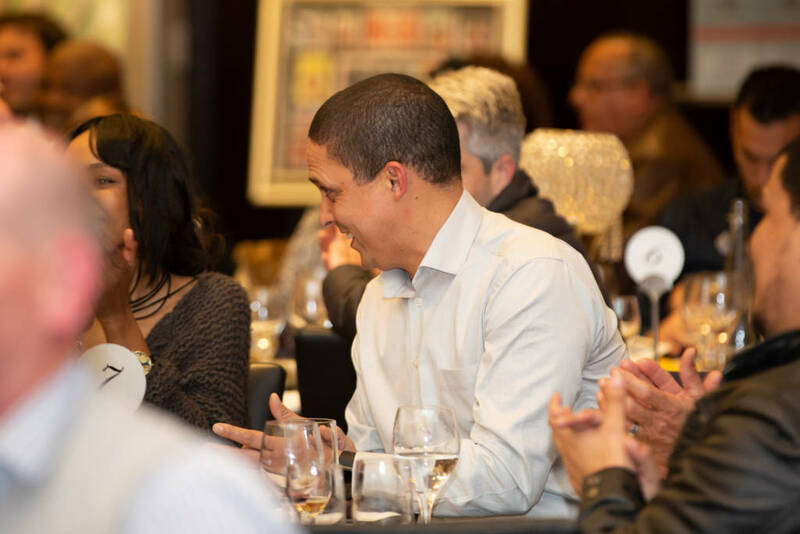 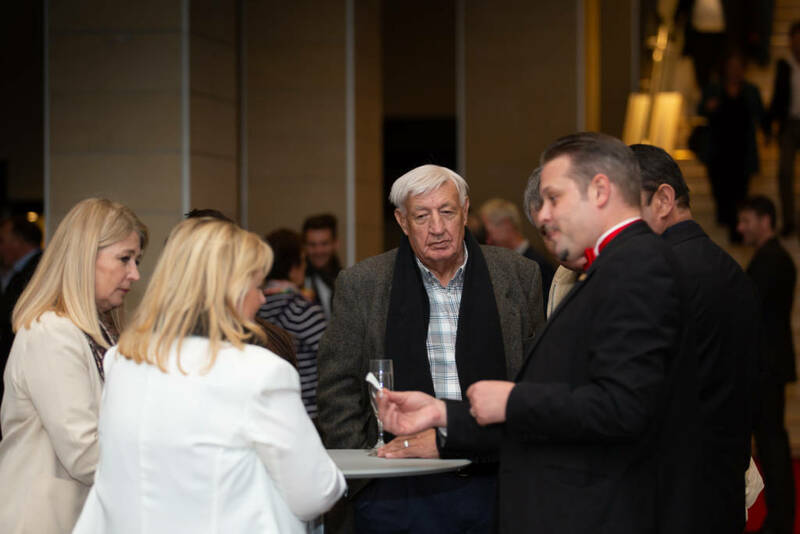 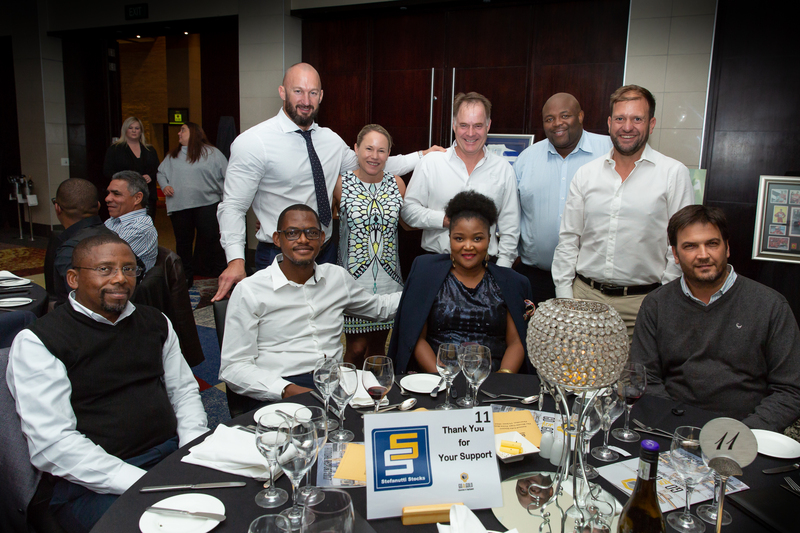 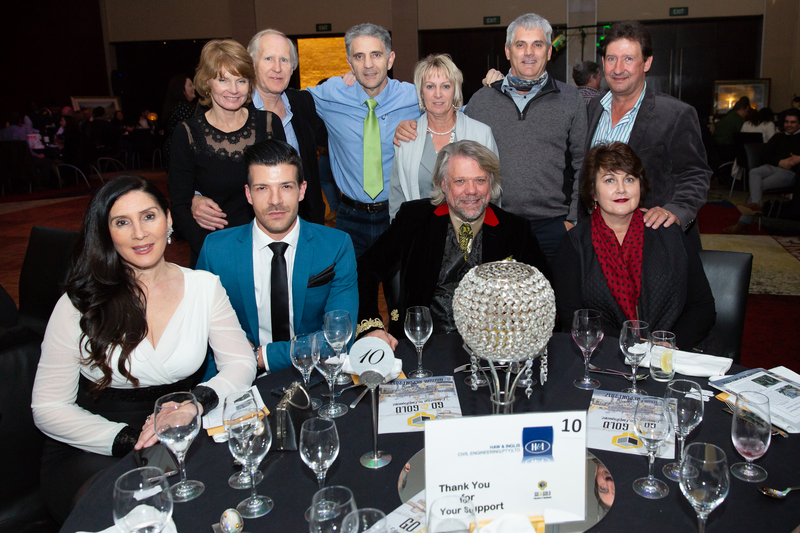 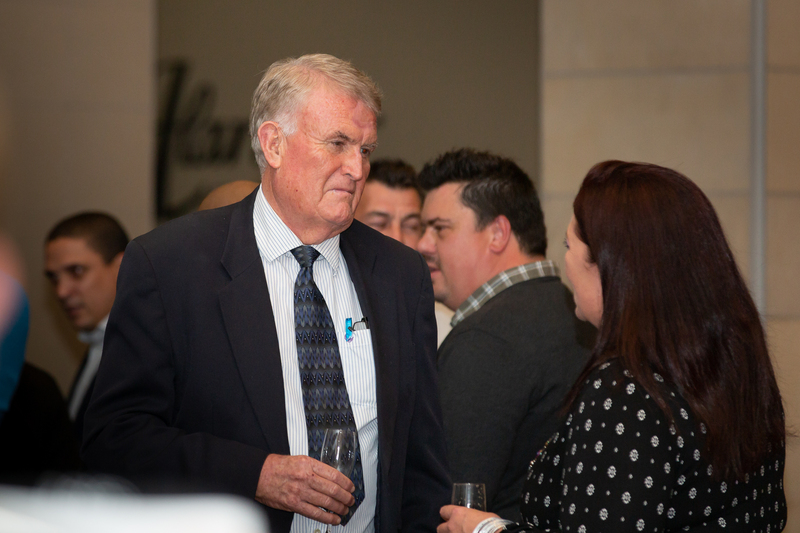 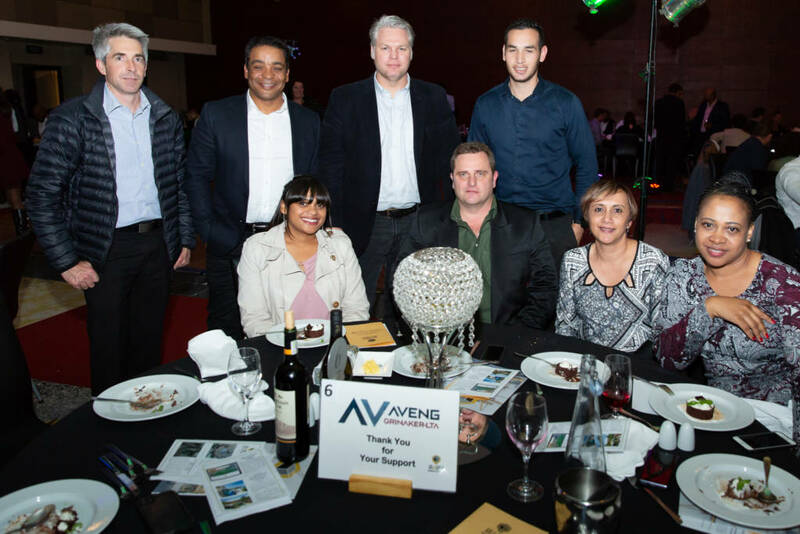 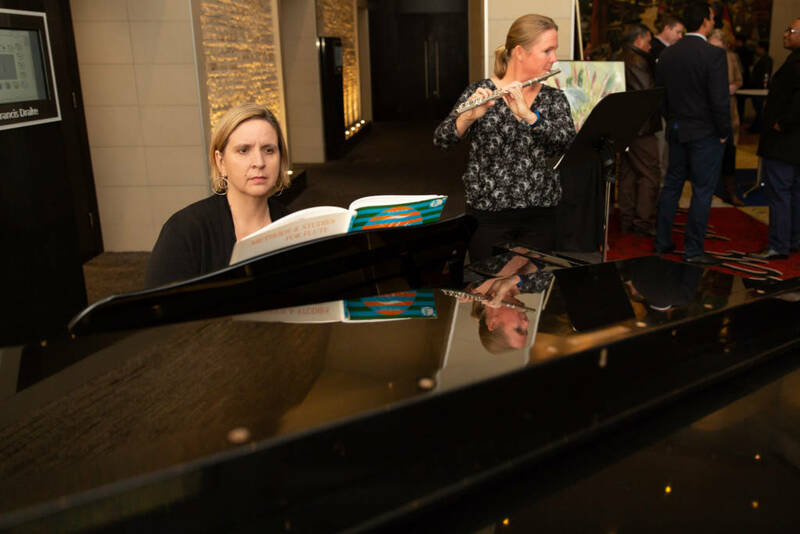 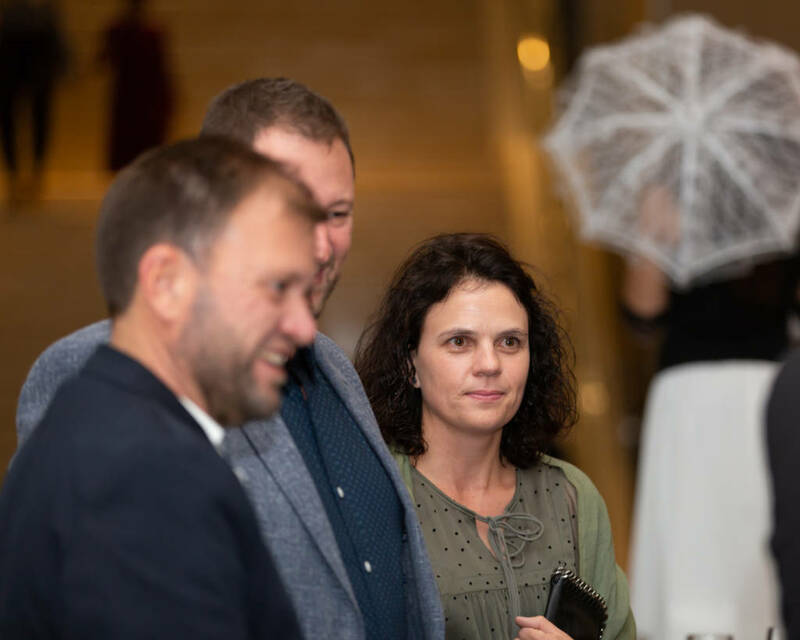 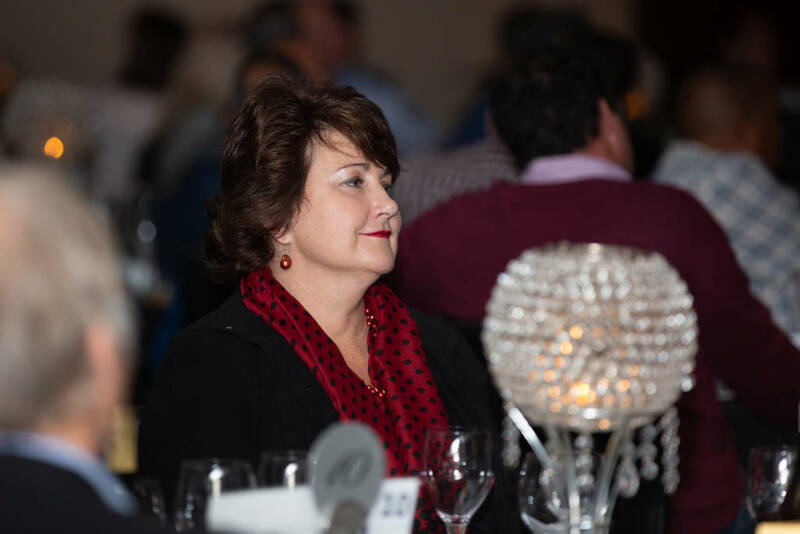 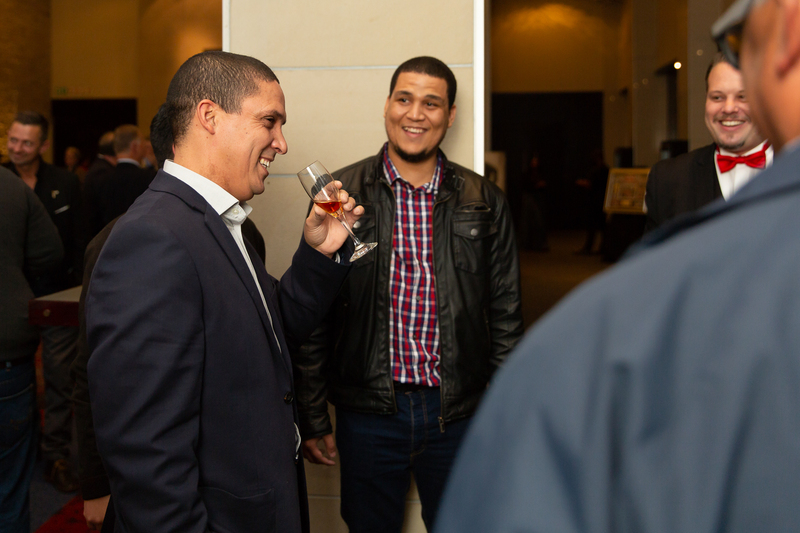 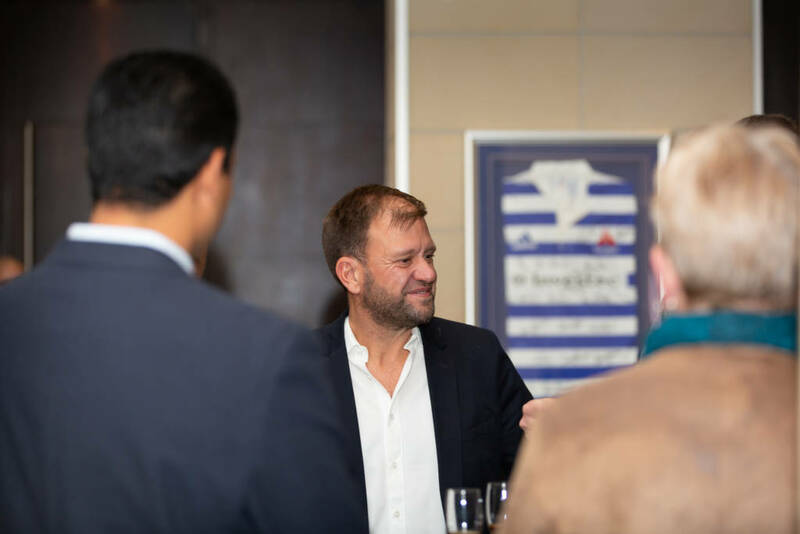 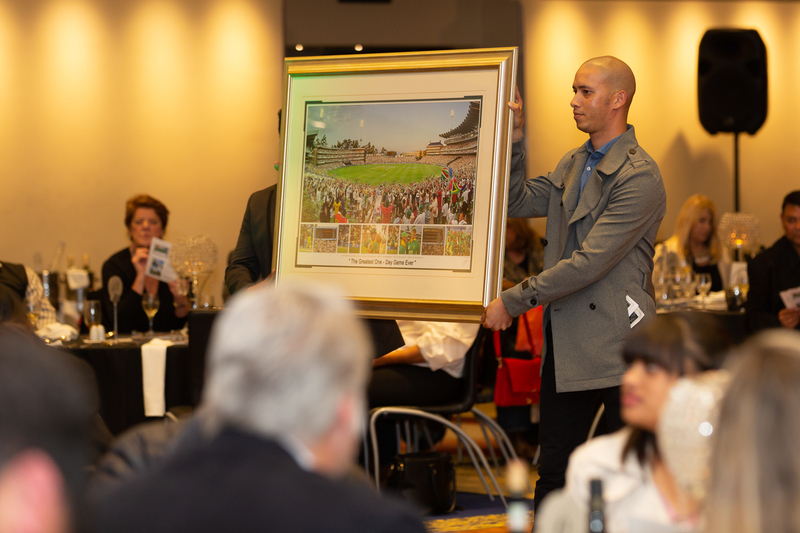 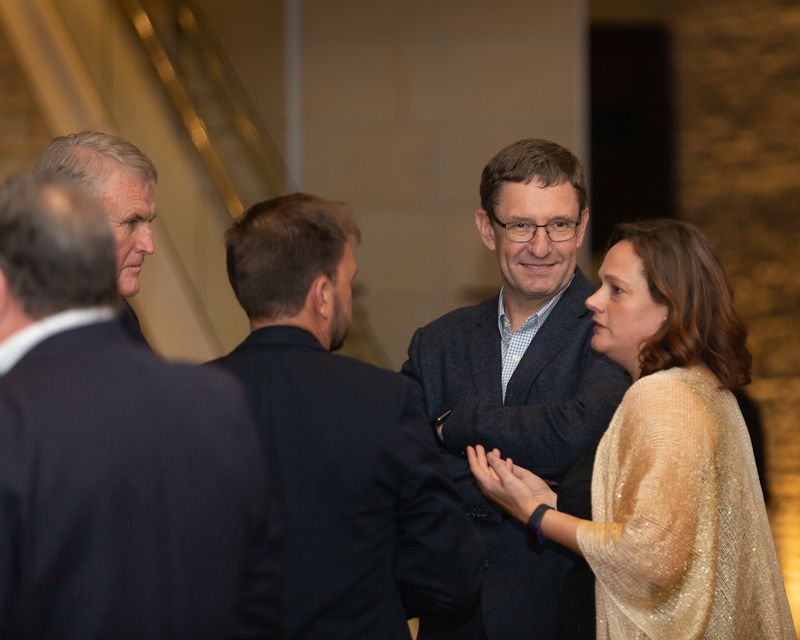 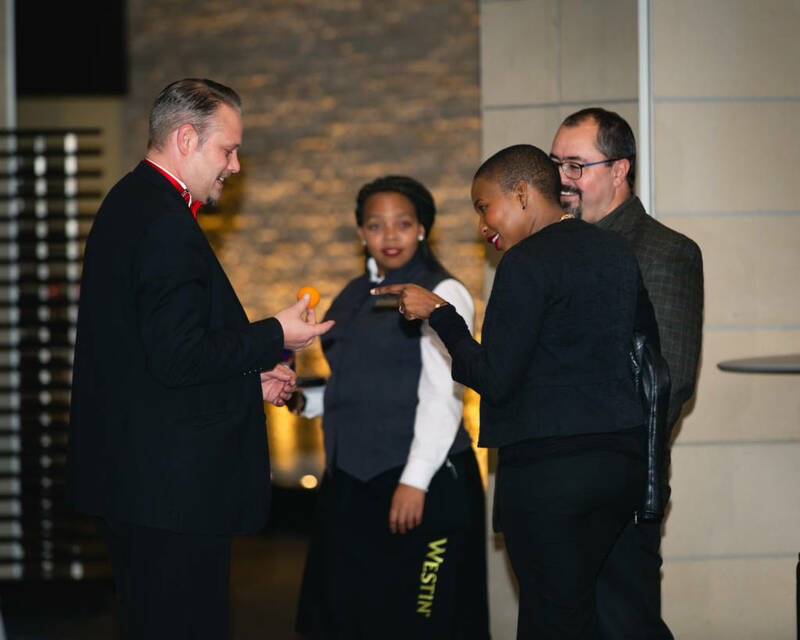 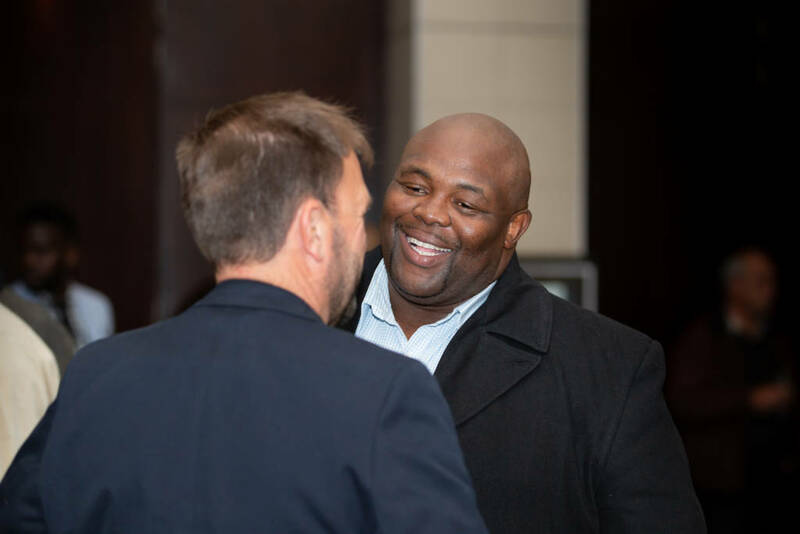 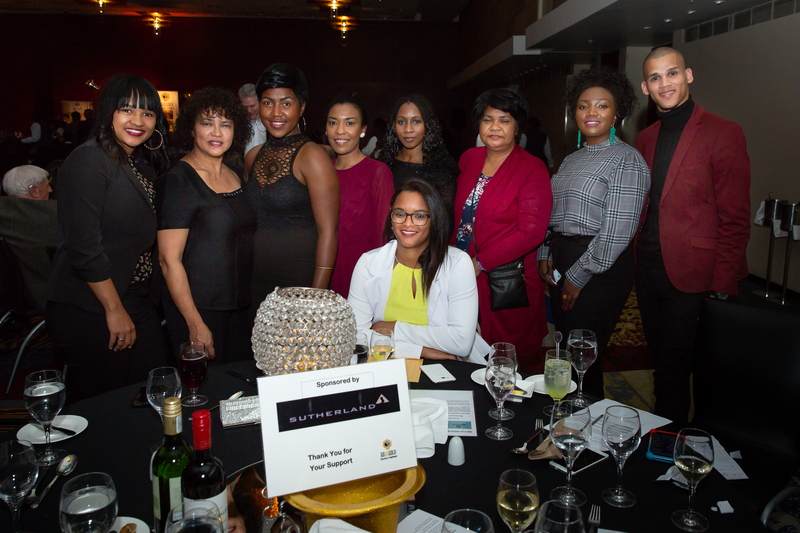 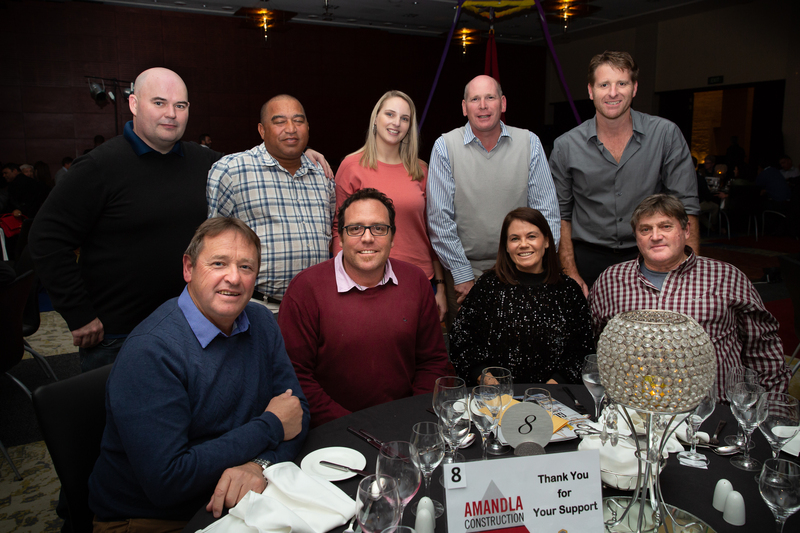 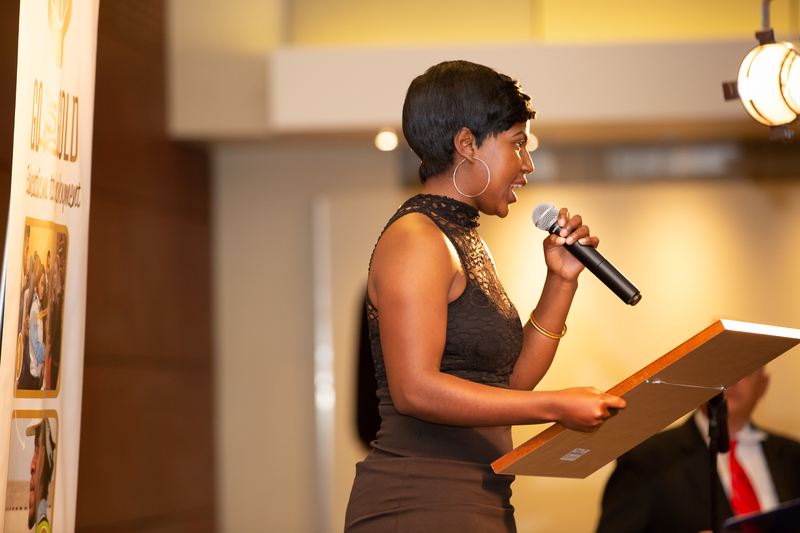 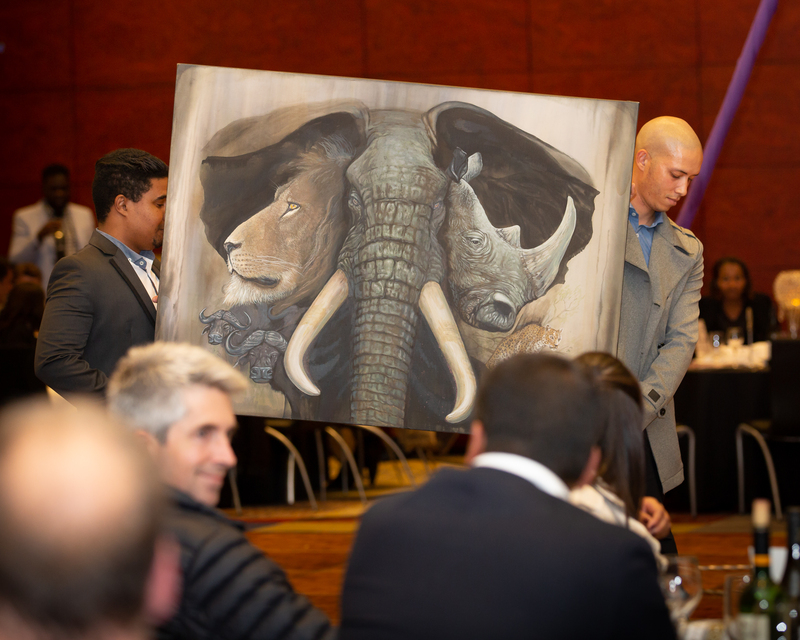 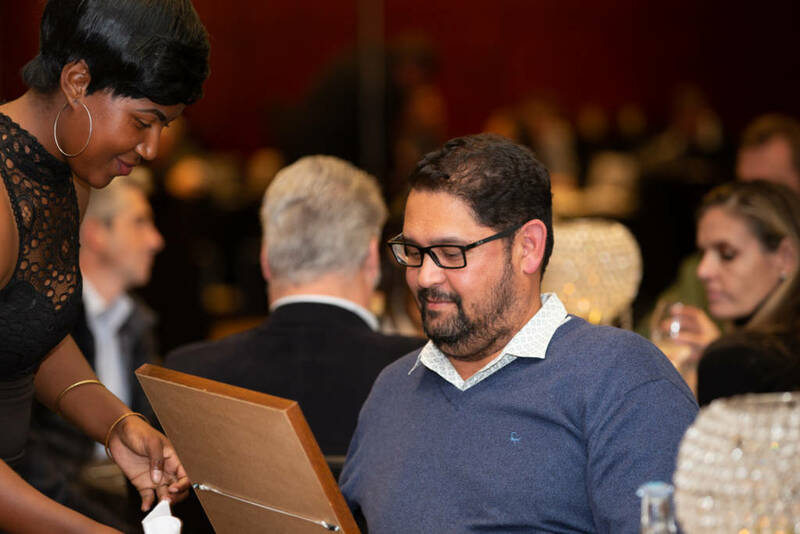 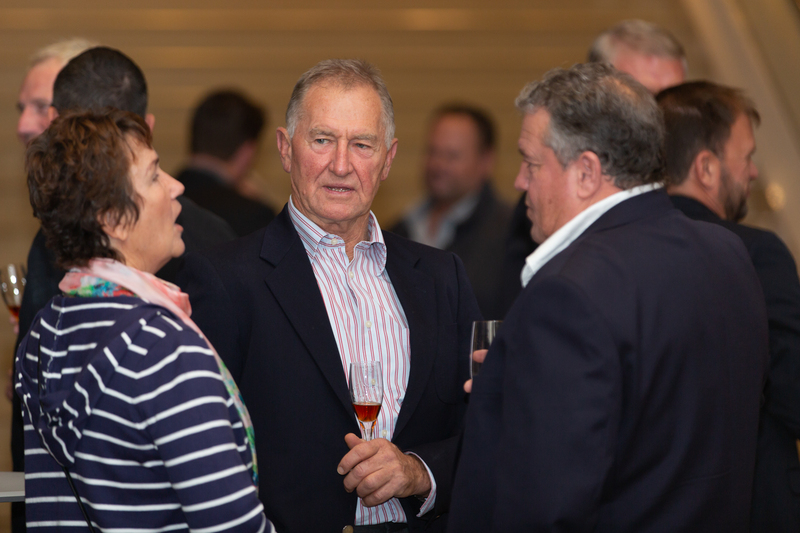 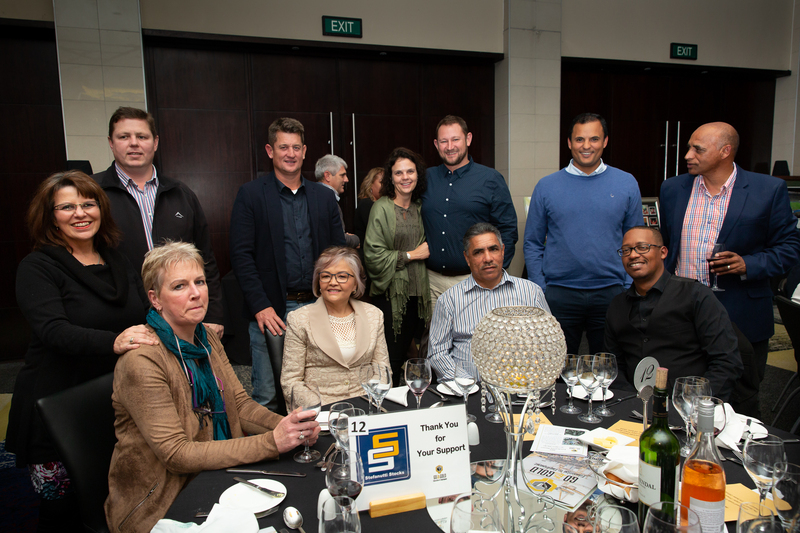 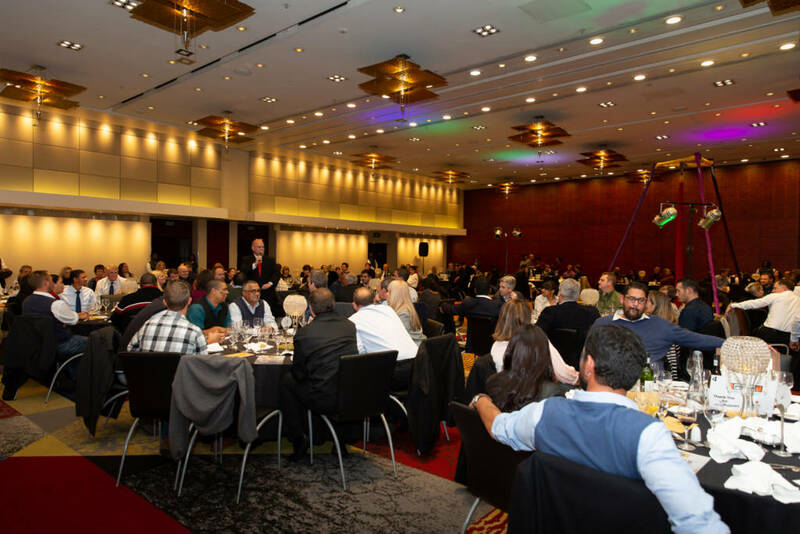 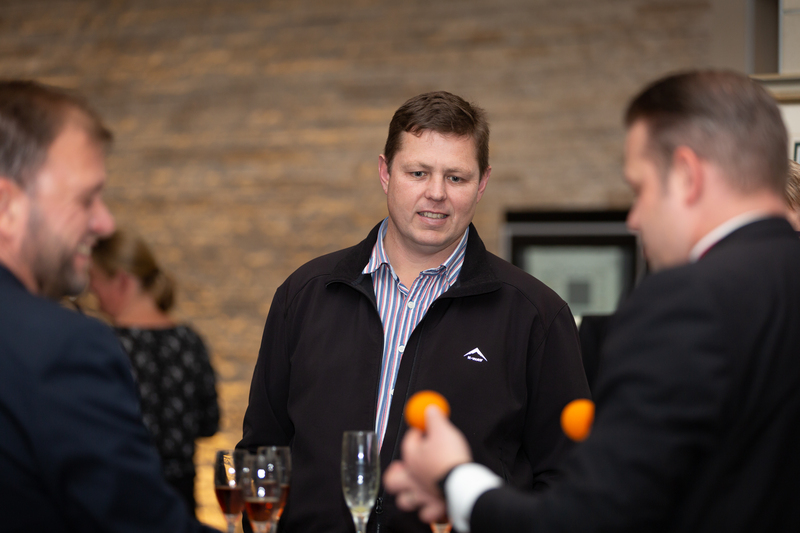 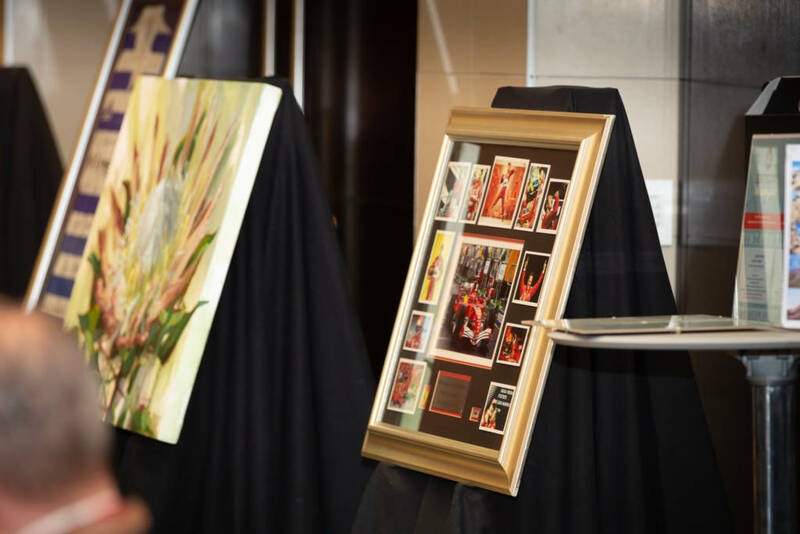 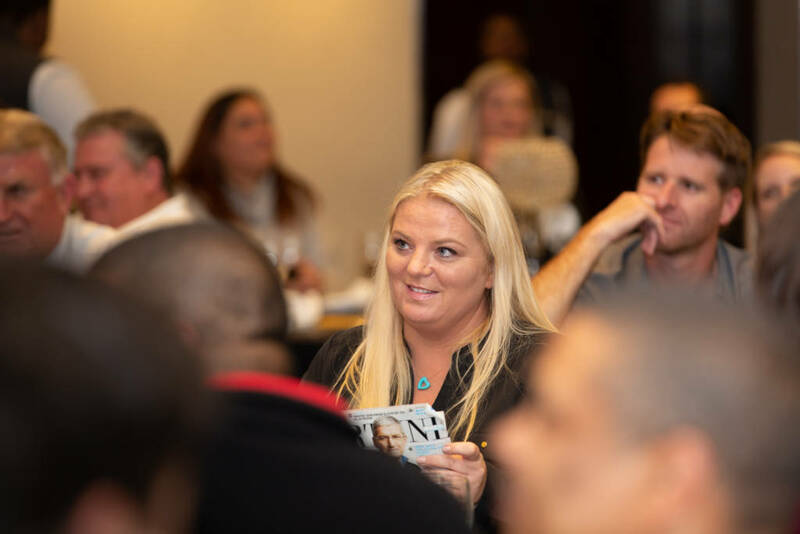 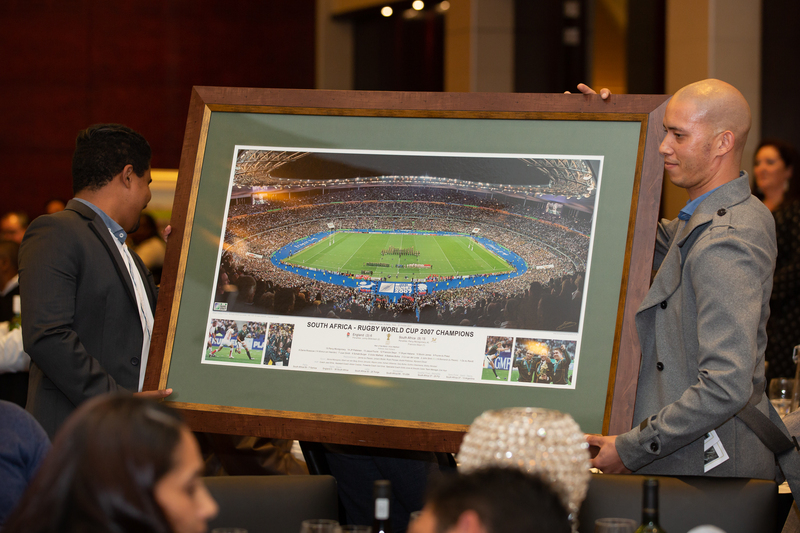 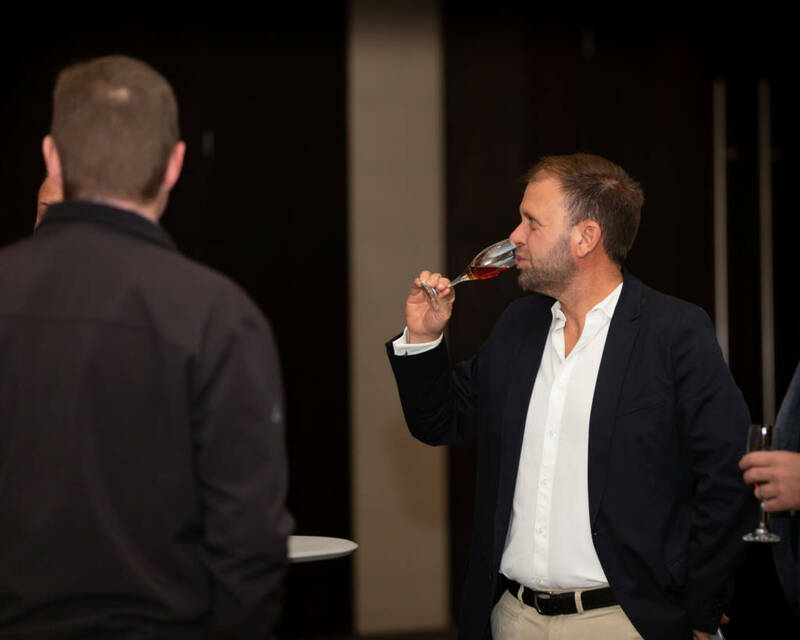 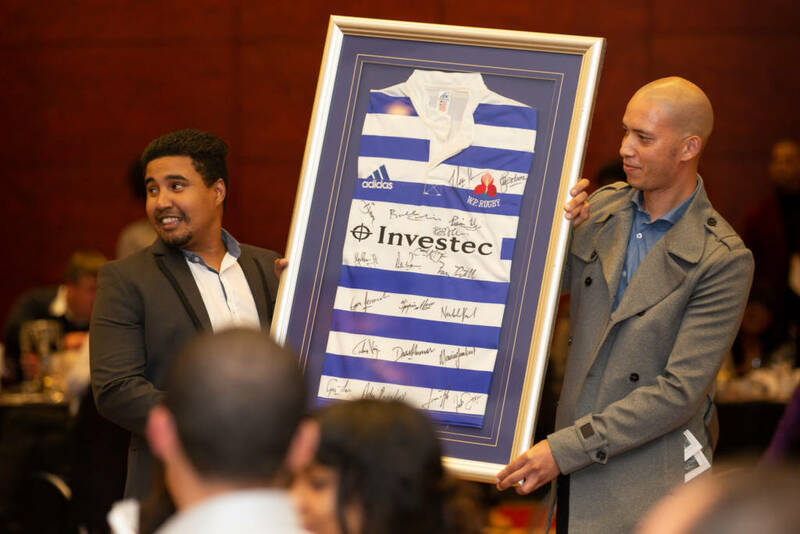 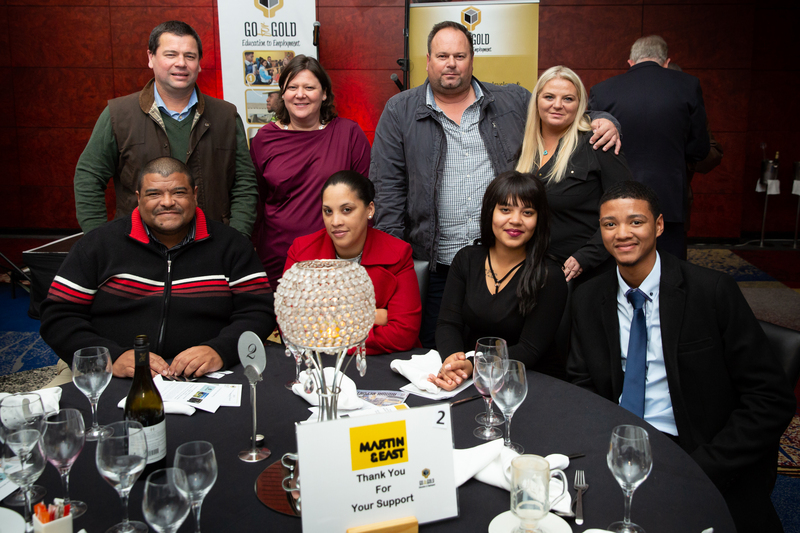 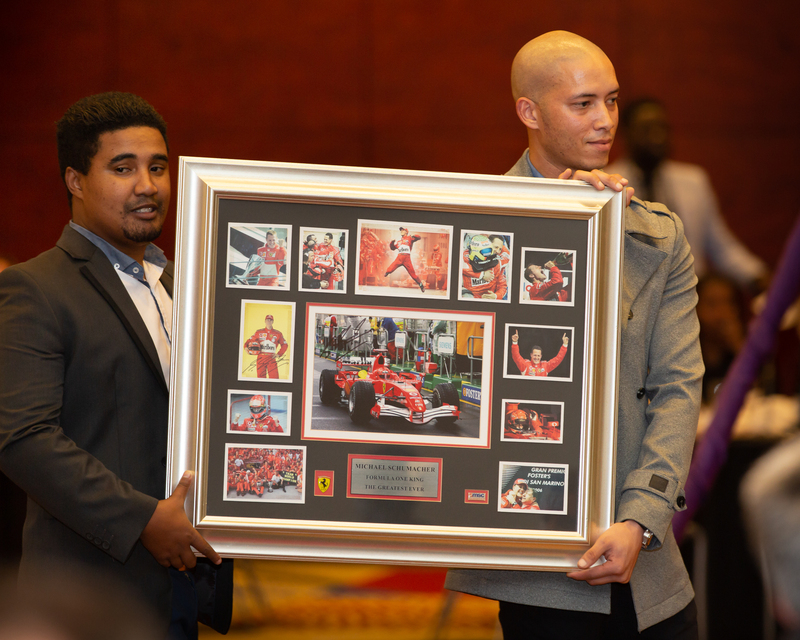 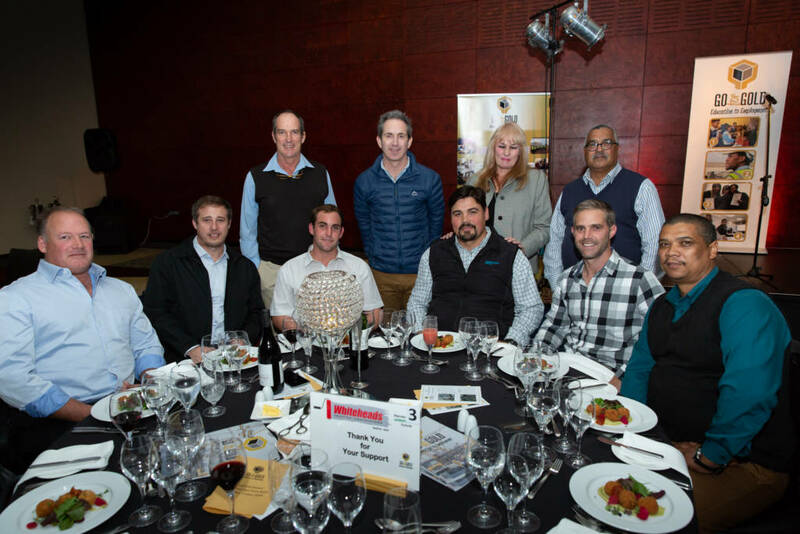 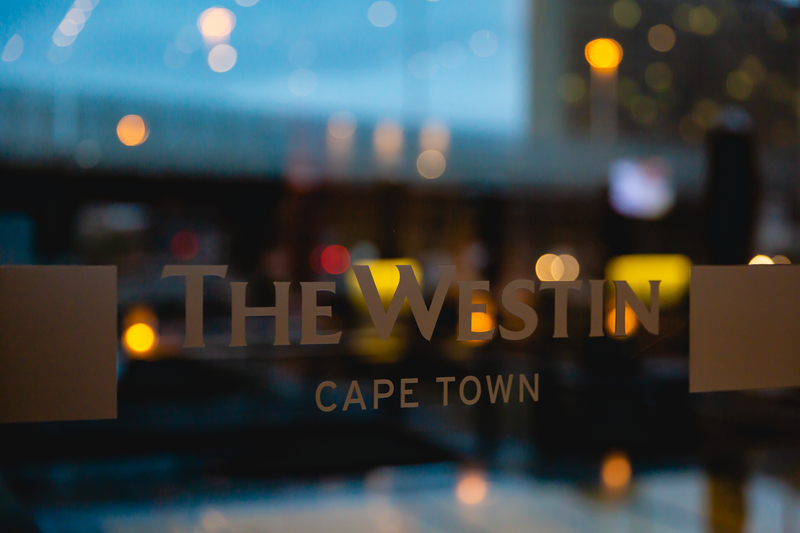 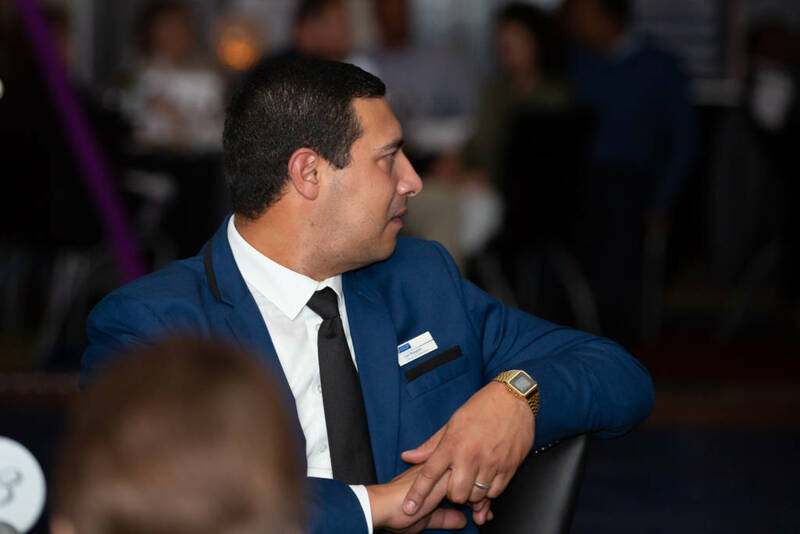 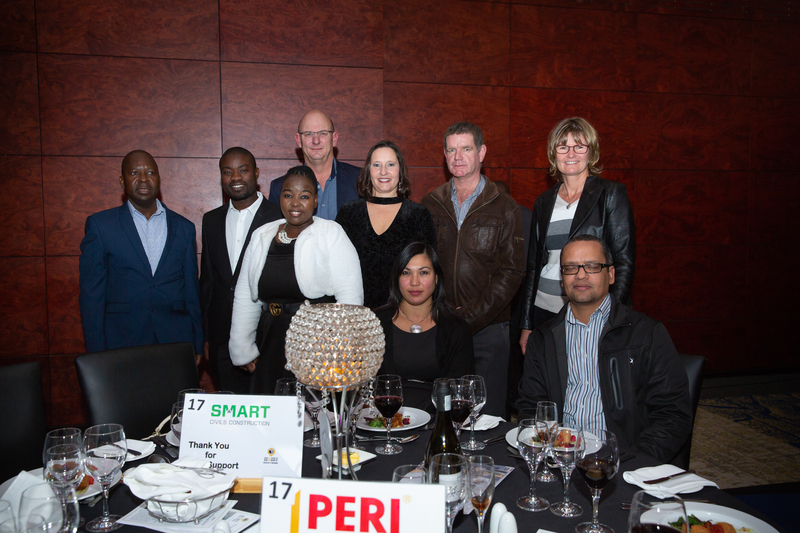 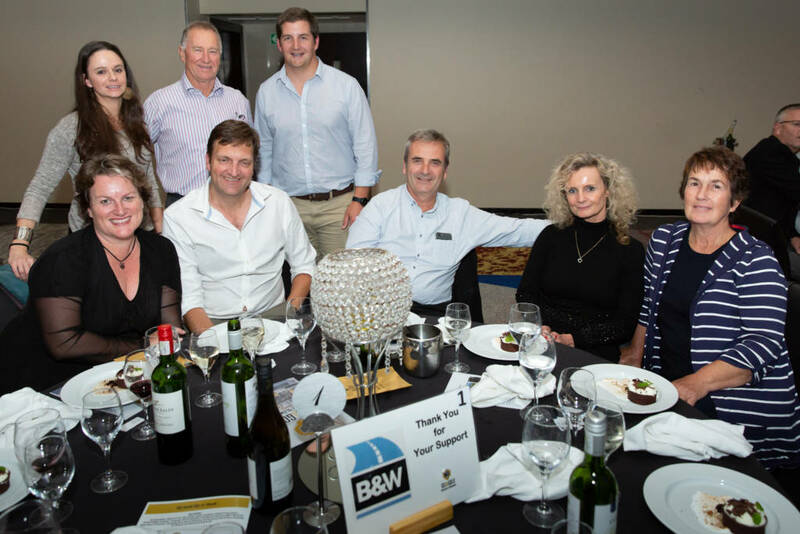 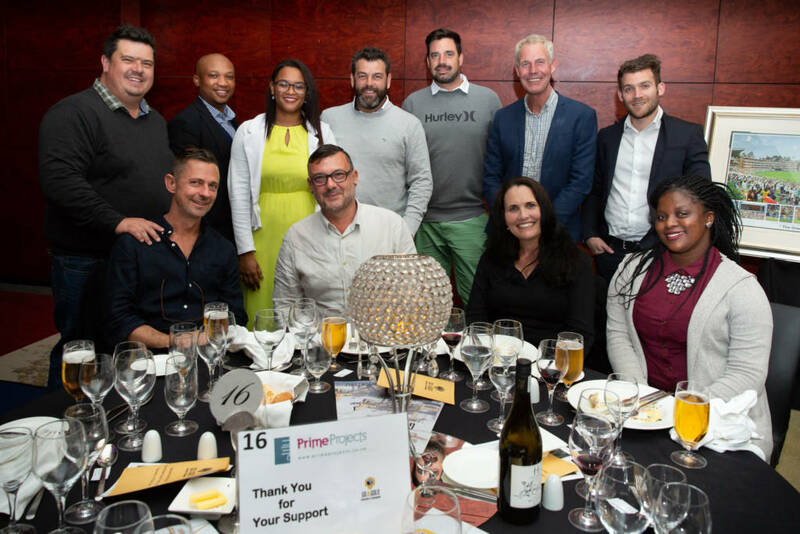 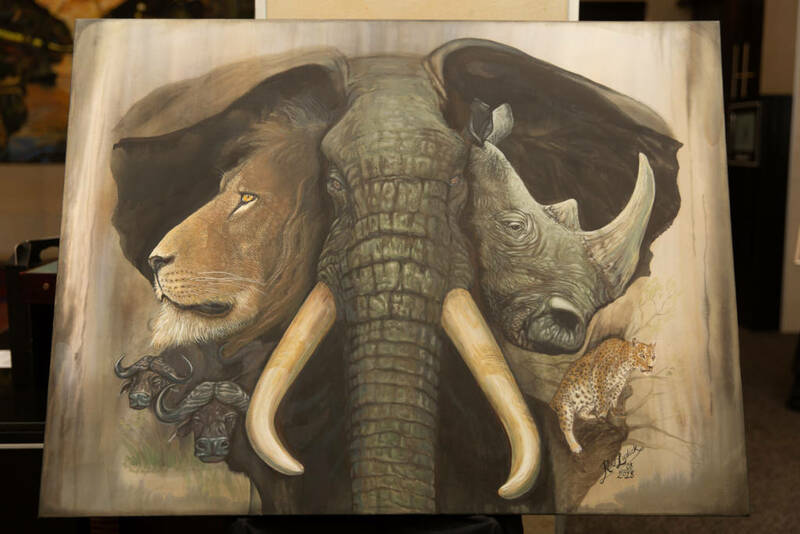 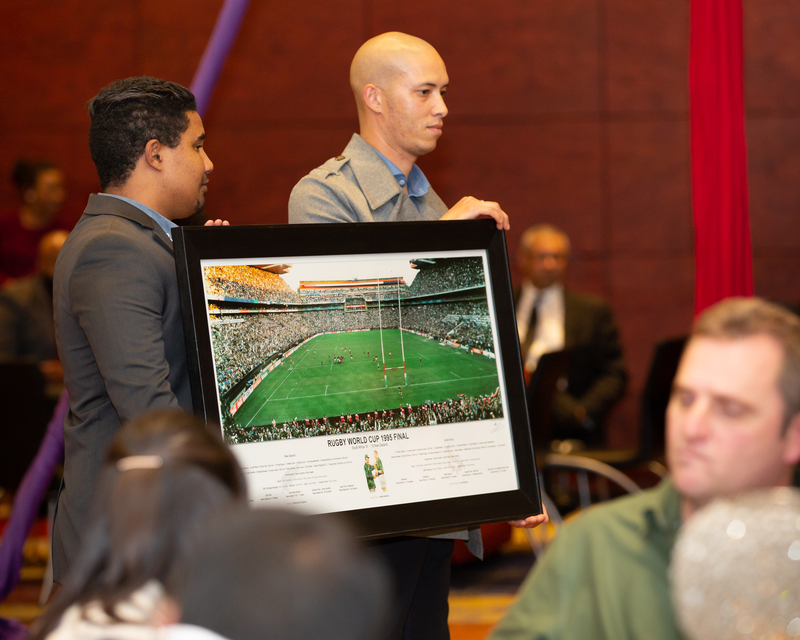 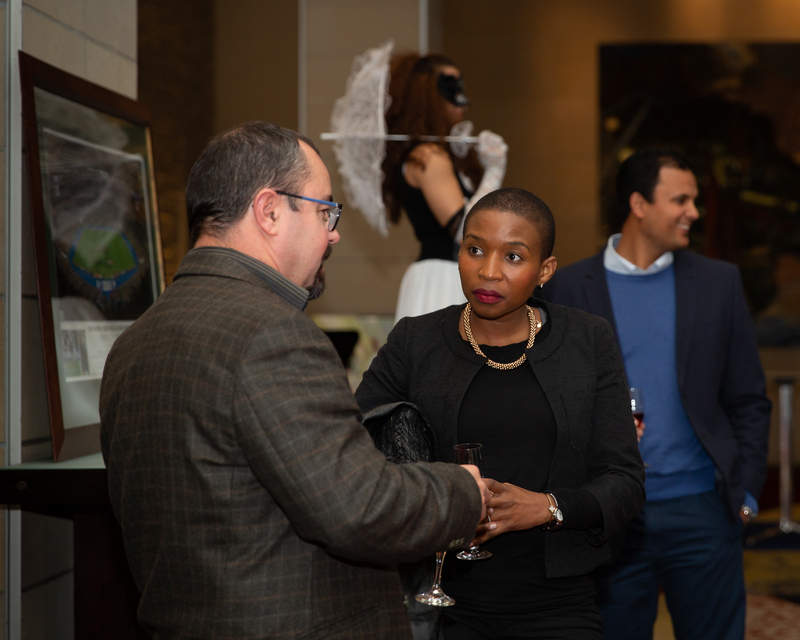 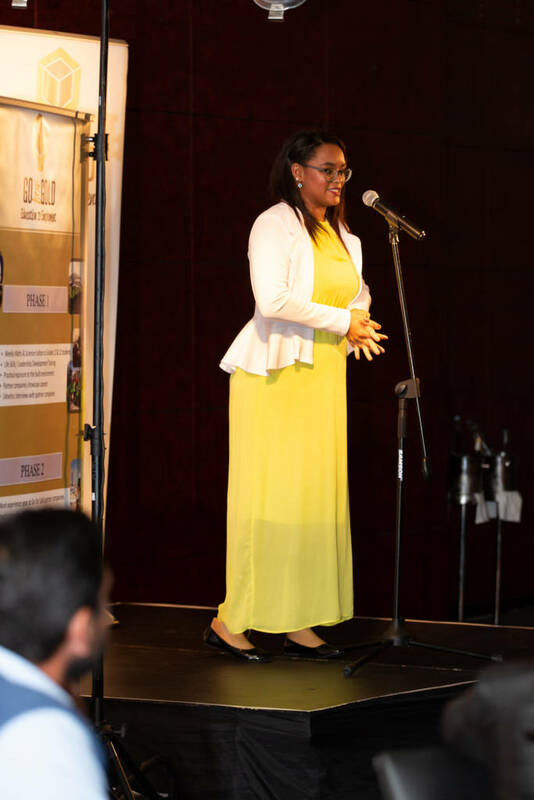 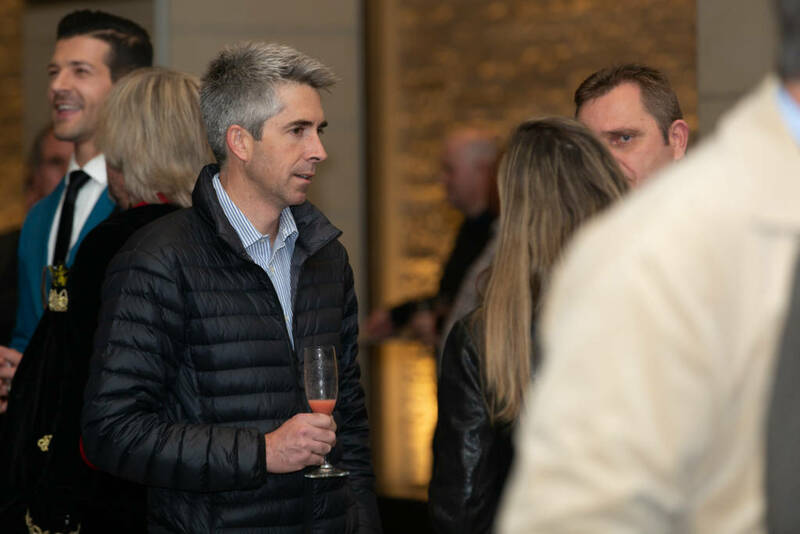 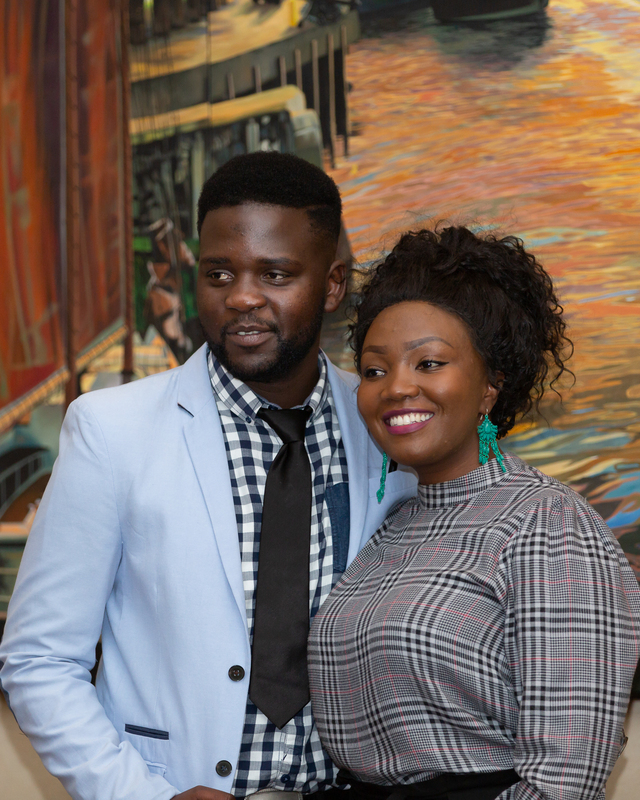 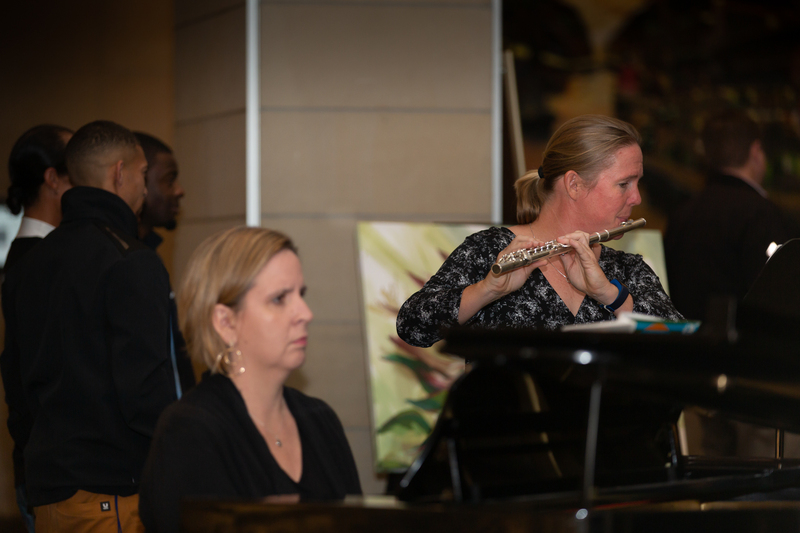 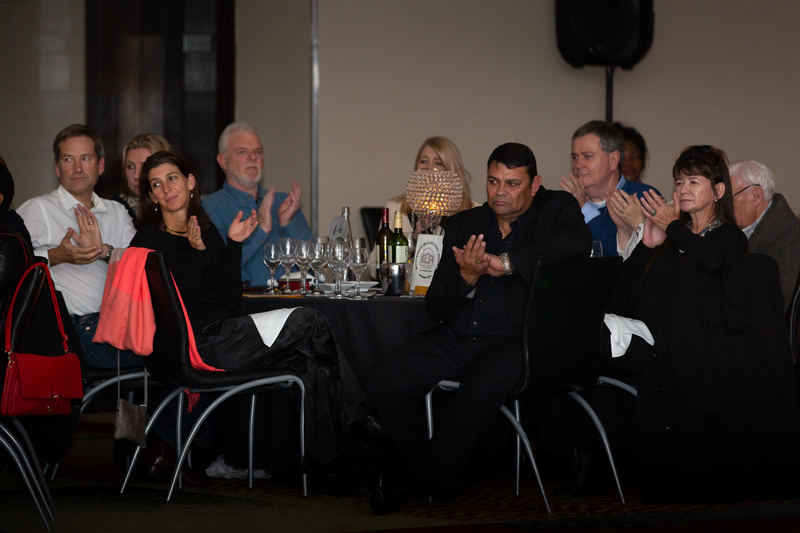 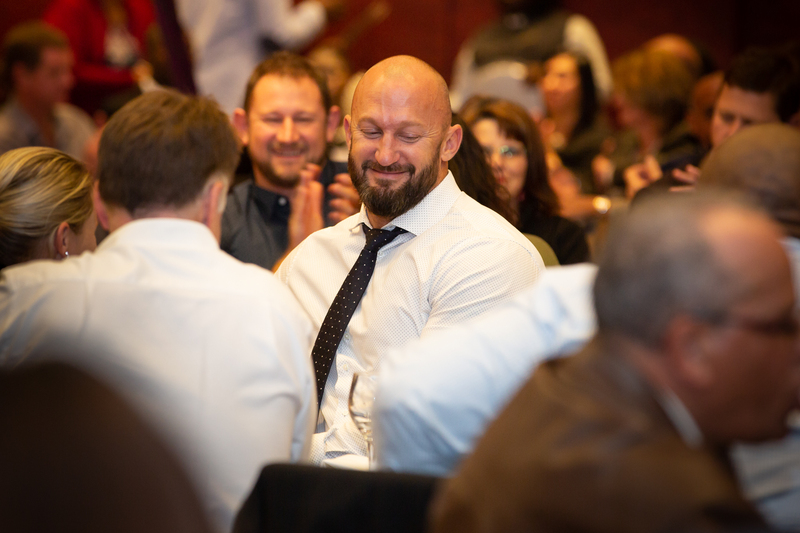 This year the Go for Gold Annual Industry Fundraising Dinner and Auction event was hosted at The Westin Cape Town on 14 June 2018. 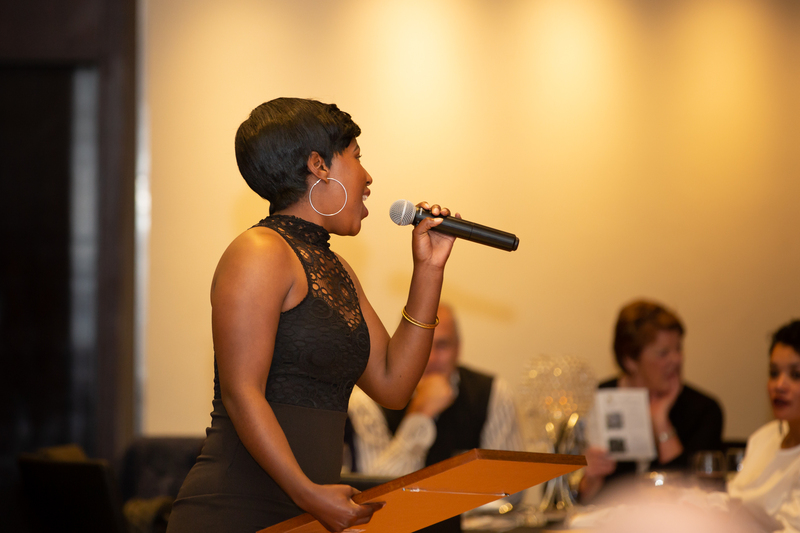 The fundraising event is intended for industry professionals to enjoy an evening of entertainment, high profile guest speakers and an auction to raise funds to capacitate Go for Gold in their efforts to develop deserving and talented youth from some of South Africa’s poorest communities, who are interested in pursuing technical careers in the built environment. 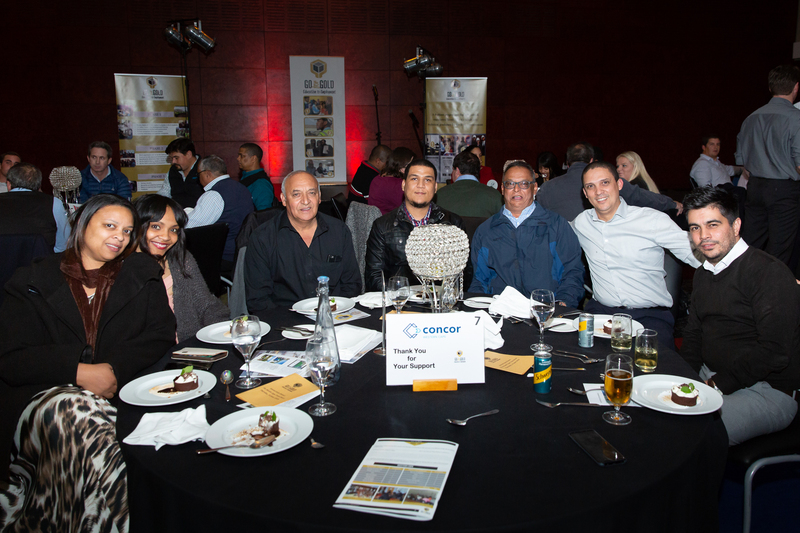 Go for Gold partners from the built environment companies continued to show their passion for youth development and creating future leaders for industry by attending the NGO’s event, despite the tough economic climate the industry is currently in. 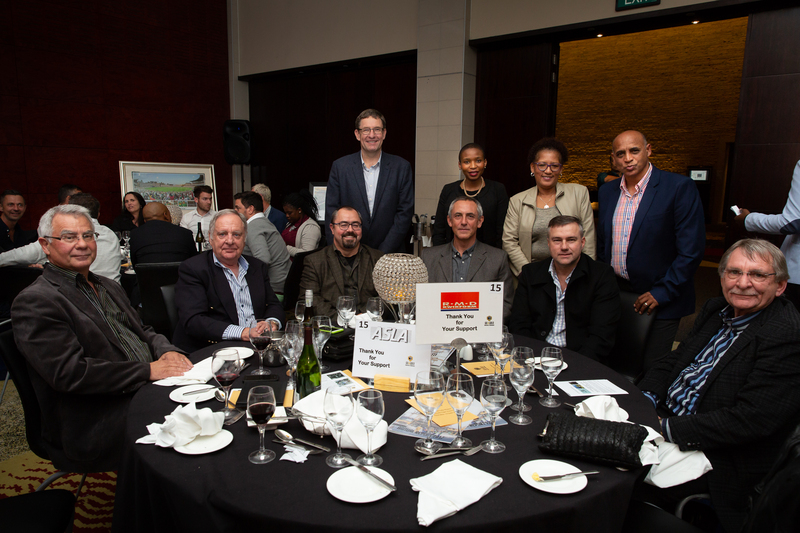 The Go for Gold partners in attendance included Amandla Construction, Asla, Avenge GrinakerLTA, Burger and Wallace, Civils 2000, Concor, Engineering Council of SA (ECSA), Haw & Inglis Civil Engineering, Triamic Construction, Martin & East, Master Builders Association WC, Peri Formwork, Power Construction, Prime Projects, R & N Master Builders, RMD Kwikform, Smart Civils, Stefanutti Stocks Corporate Services and Whiteheads Painting Contractors. 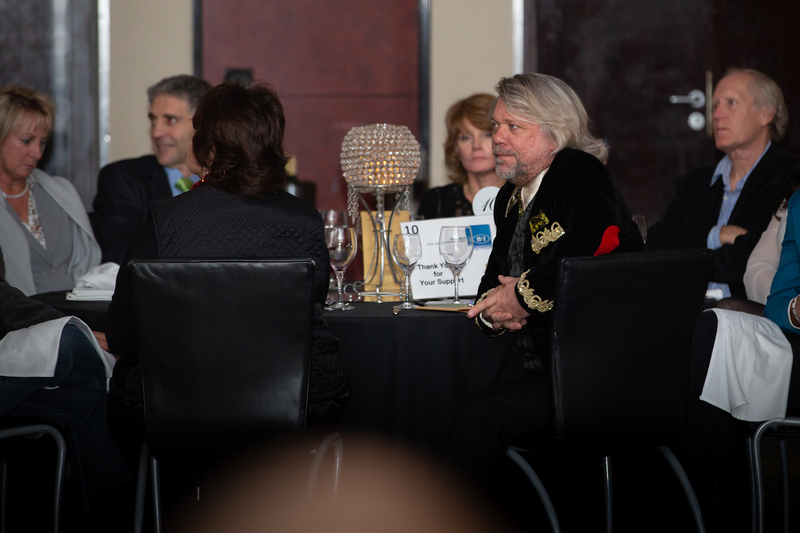 Among the audience included esteemed guests that work with these built environment companies and Go for Gold donors. 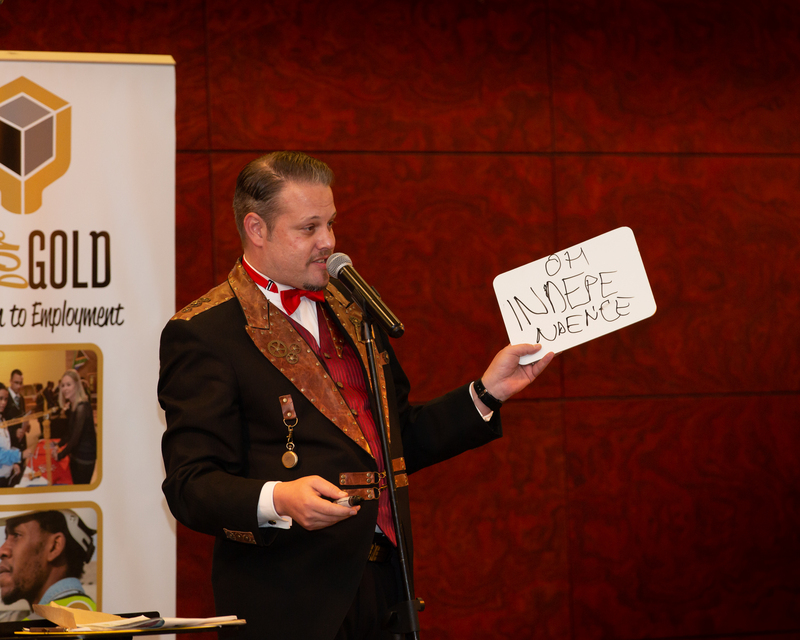 MC for the evening, Marcel Oudejans: As “Corporate Magician”, Entertainer and Master of Ceremonies, Marcel has performed for dignitaries, celebrities and over 180 large multi-national corporations for more than 2 decades; from small intimate audience settings to large-scale broadcast events. 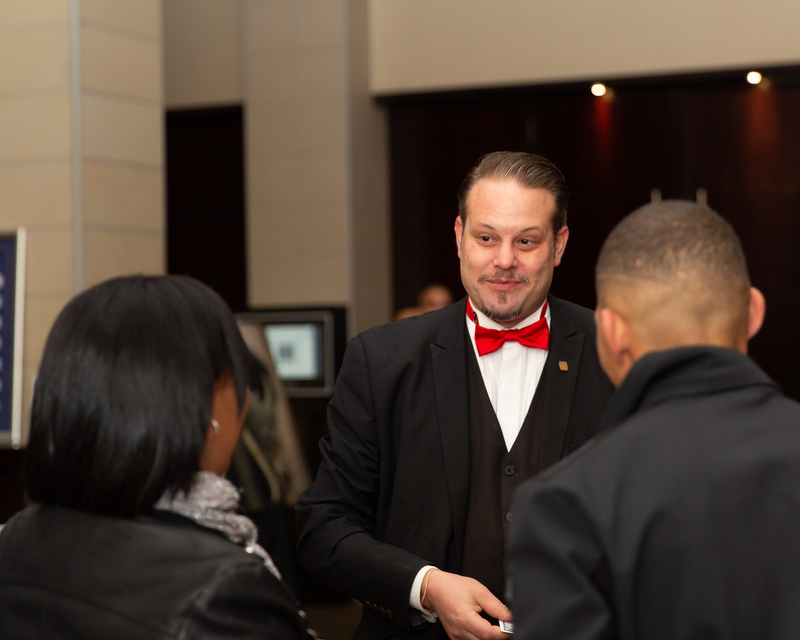 Marcel has personally produced over 200 theatre shows and is the Founder & Producer of Africa’s Premier Magic Theatre, Cape Town Magic Club. 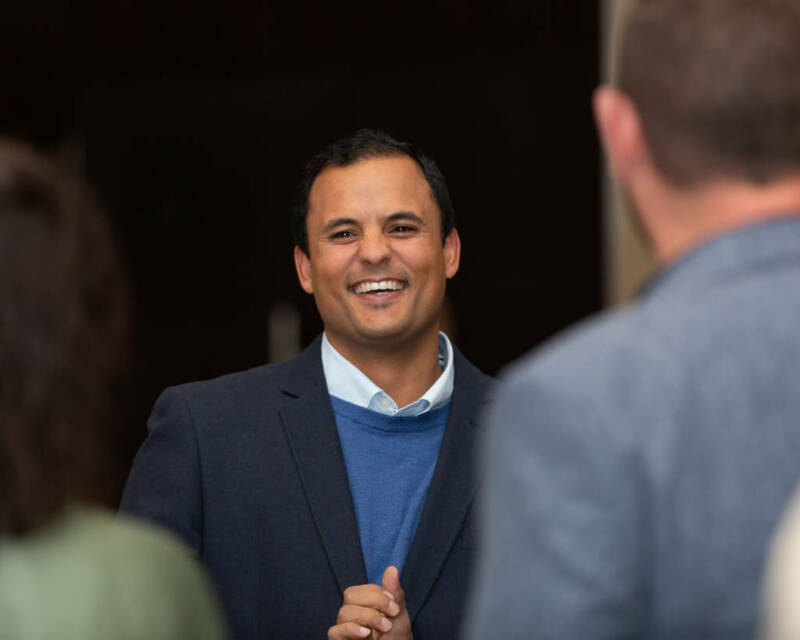 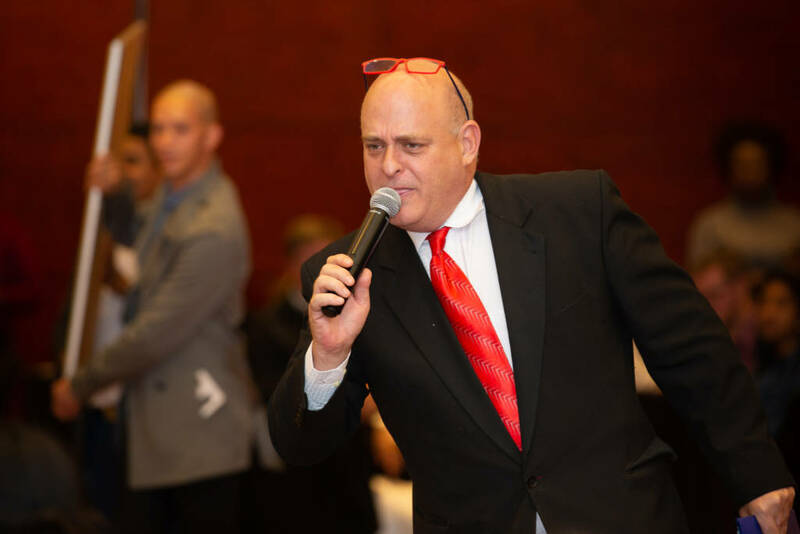 Marcel is indeed one of South Africa’s dynamic personalities, entertaining diverse audiences with a sparkling personality that knows how to communicate, make people laugh and create memorable experiences for you! 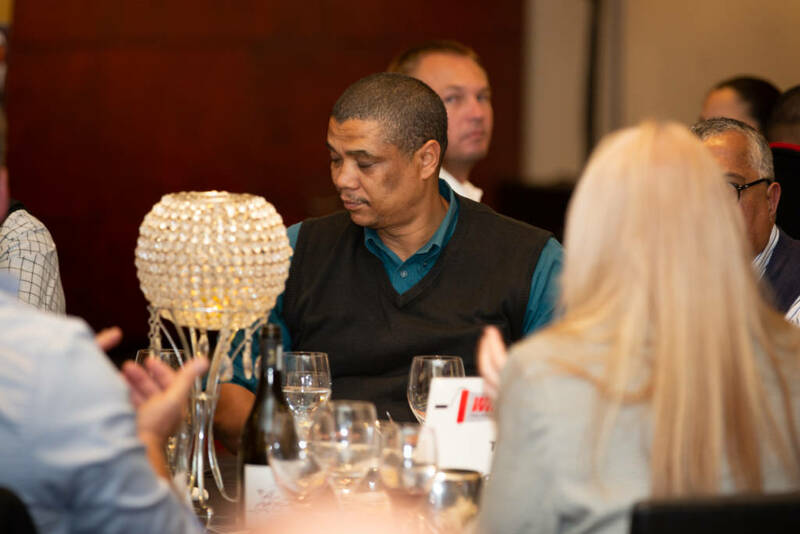 Guest speaker, CEO of Community Chest South Africa: Lorenzo Davids: An Experienced Chief Executive Officer with a demonstrated history of working in the civic & social organization industry, Lorenzo is skilled in Nonprofit Organizations, Corporate Social Responsibility, Grant Making, Fundraising, Event Planning, Coaching, and Nonprofit Consulting. 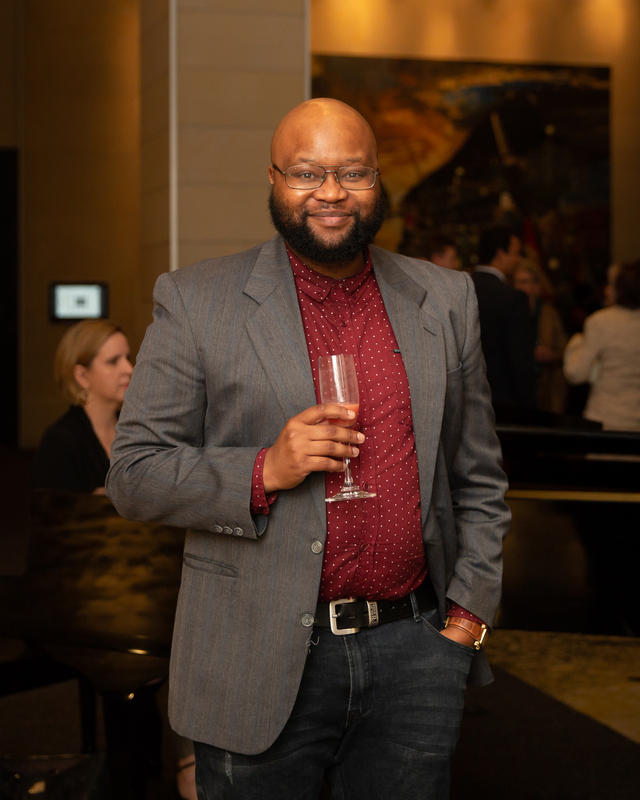 He has a strong business development professional background with an Honours Degree focused in History from University of the Western Cape. 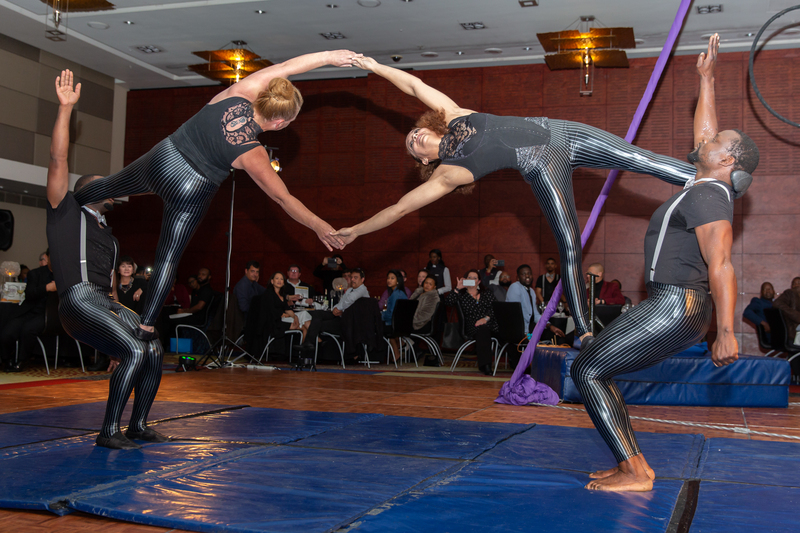 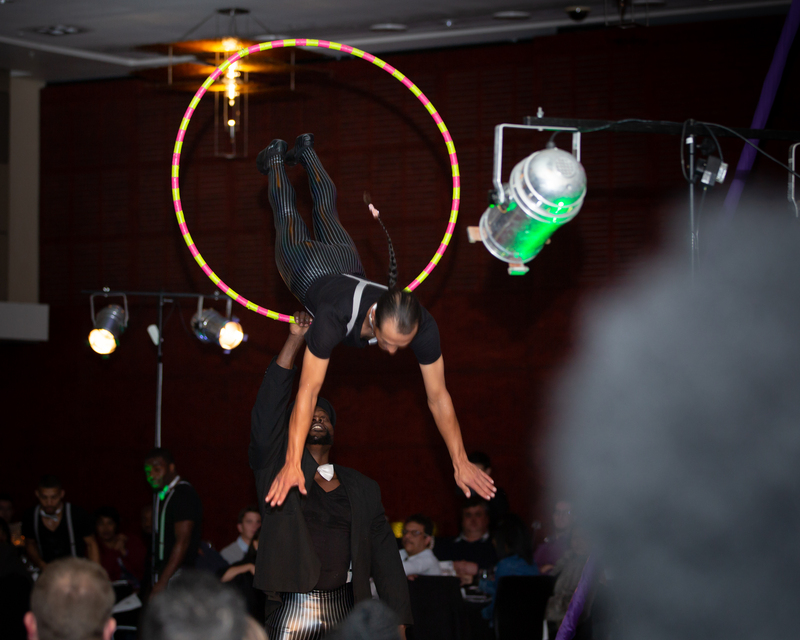 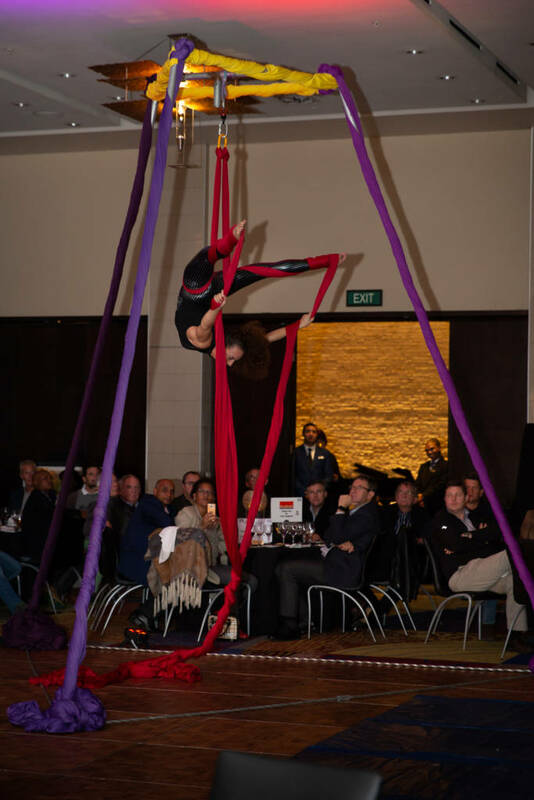 ‘Cirque du Soleil’ entertainment by The Silk Workshop: From Aerial Acts to Ground Acts, The Silk Workshop provides visual masterpieces comprising of professional and charismatic performers guaranteed to bring a magical and exciting element to any event. 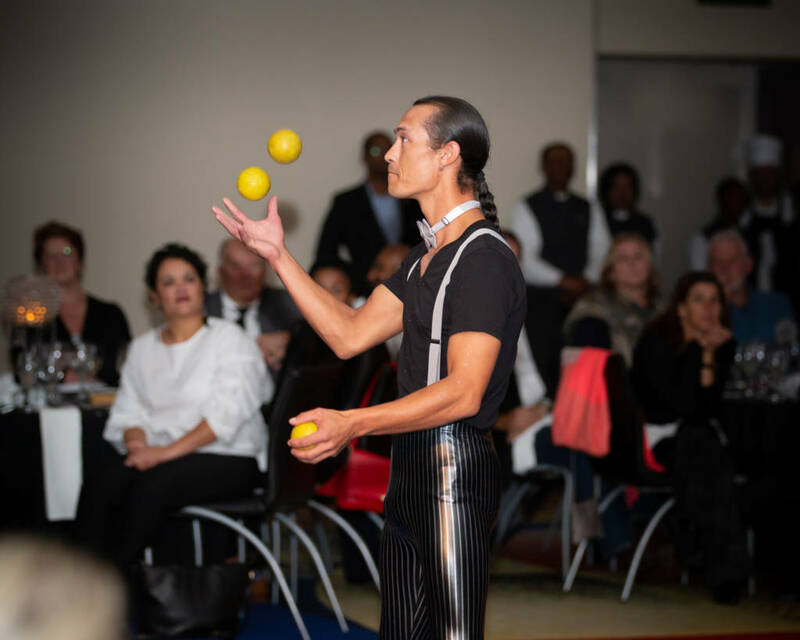 They will thrill you with exquisite entertainers and beautiful costumes in an array of mesmerizing performances that will leave you spellbound and the evening unforgettable. 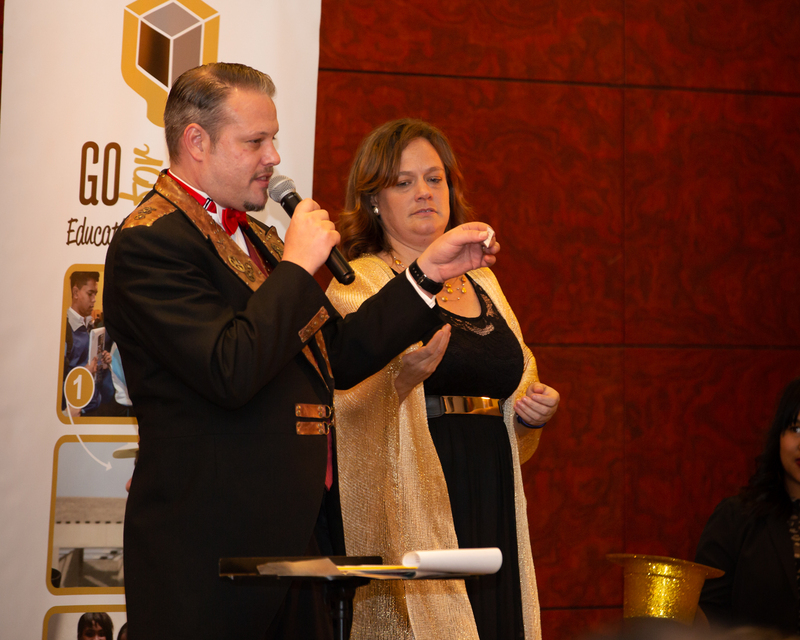 Go for Gold Alumni Testimonials by Christine Riffel and Michelle Marco: Both Christine and Michelle have been with Go for Gold for many years: 2012 and 2006 respectively. 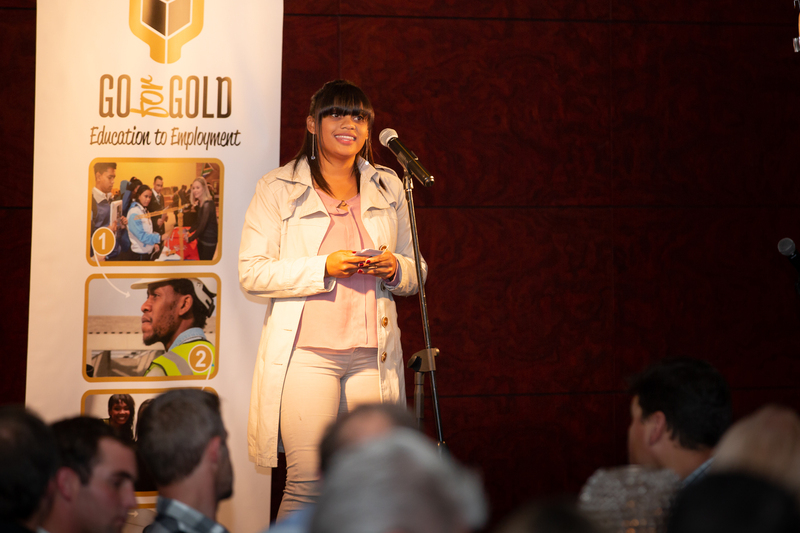 They remain strongly connected to the programme through their companies but also through mentoring the younger Go for Gold participants. 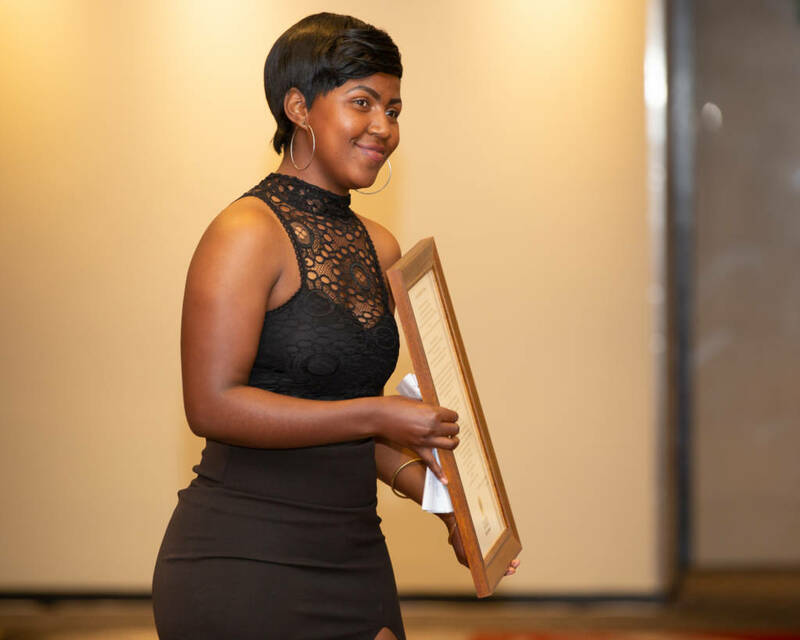 Both graduated from CPUT having studied Civil Engineering. 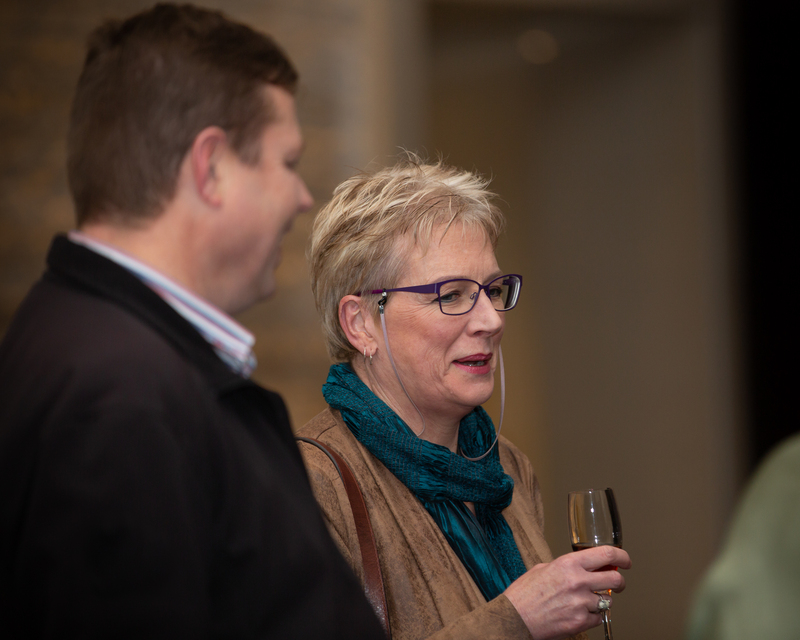 Michelle is currently a manager at Prime Projects and Christine remains a site engineer with Aveng Grinaker LTA. 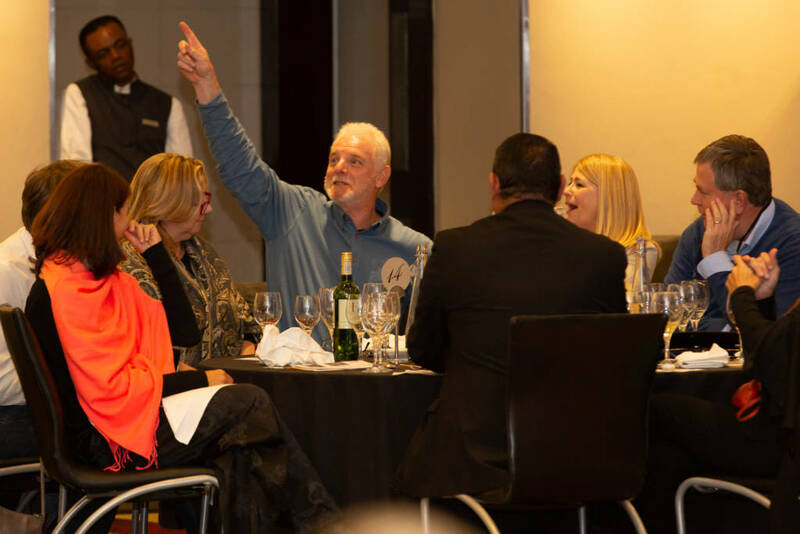 Auction-tainment by Charity Auctioneer, Motivational Speaker and Real Estate Auctioneer, Mr Joey Burke from GoIndustry Dovebid: Joey has been working in the auctioneering trade for 38 years and his knowledge and complete understanding of the business provides the perfect platform for successful asset and real estate sale realisation. 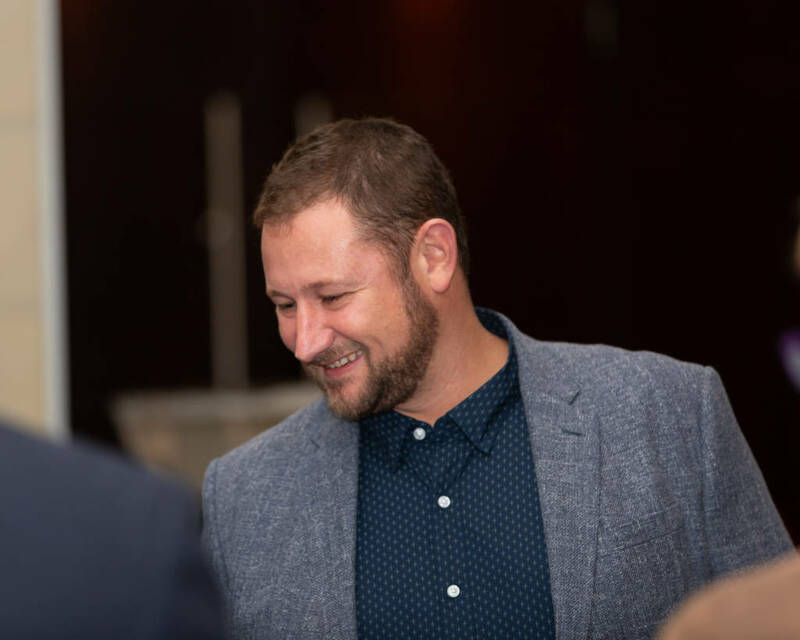 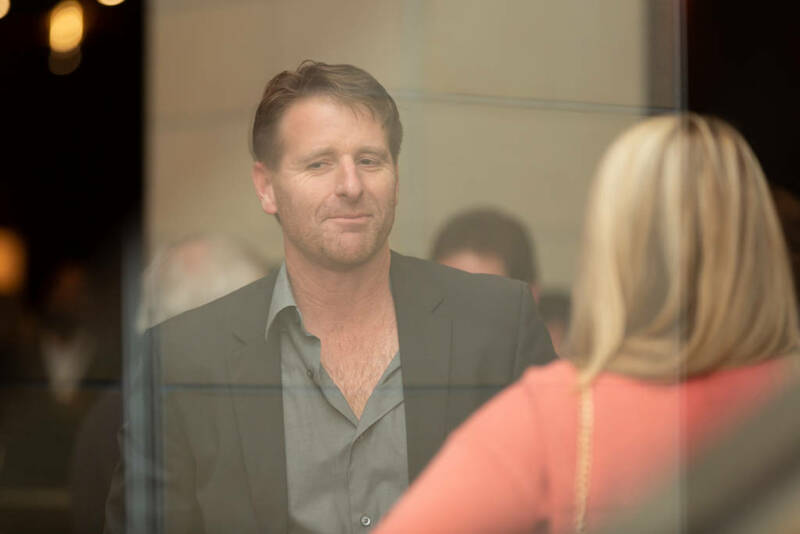 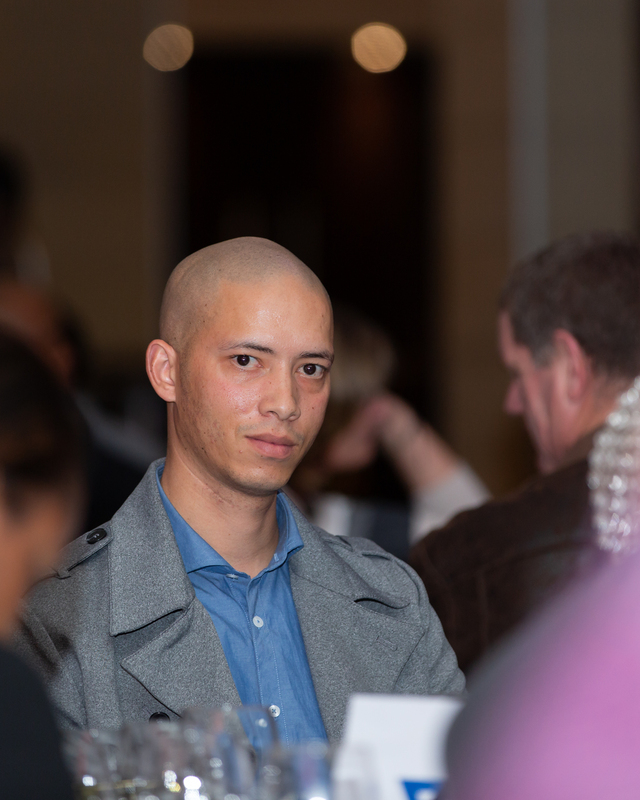 He has been with GoIndustry DoveBid for 7 years and operates with integrity, transparency and real passion for what he does. Joey Burke has conducted high profile NGO auctions and we are pleased to have him back at Go for Gold Gala Dinner in 2018. 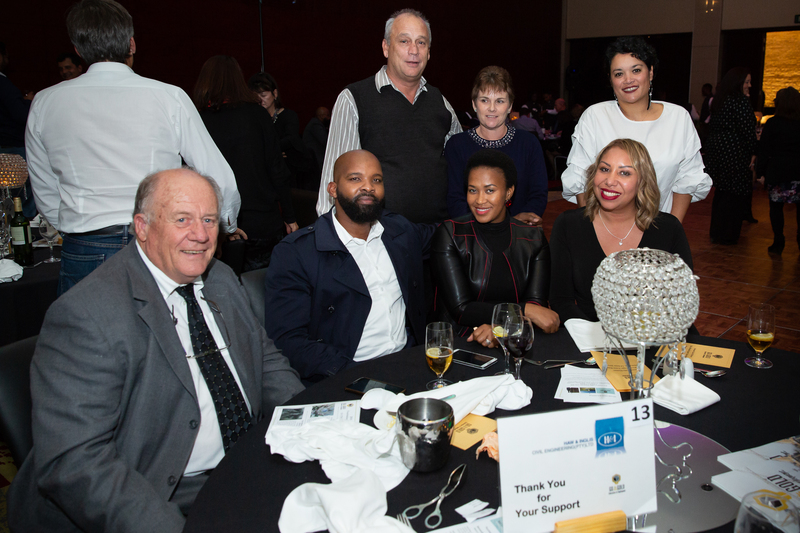 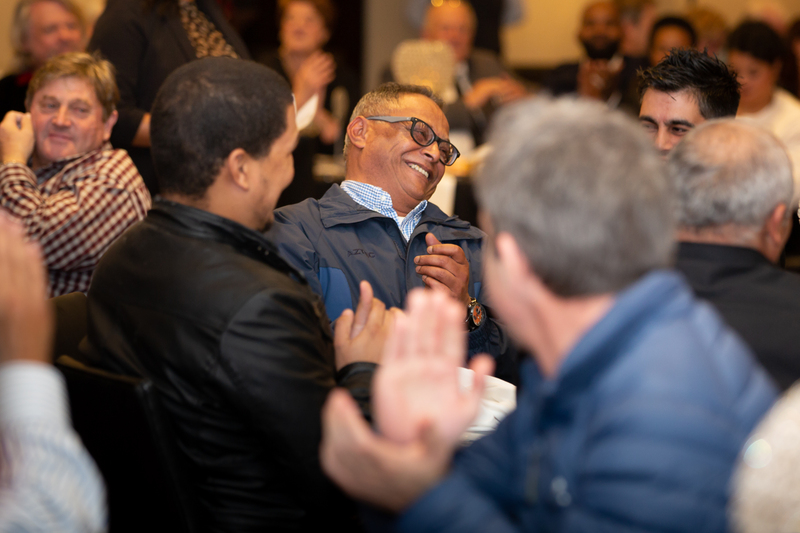 A total of R521 000 was raised at this year’s event and all funds raised at the Go for Gold annual industry event are allocated toward direct programme expenses to support the beneficiaries and future leaders of industry on the 4 phased Go for Gold programme. Each phase of the programme supports beneficiaries academically, personally and professionally while affording companies multiple ways to gain return of their investment. Go for Gold predominantly operated in the Western Cape but as of 2015 expanded the programme to Gauteng and the Eastern Cape. Go for Gold are constantly enlisting new partner companies in each region to speed up opportunities for youth interested in pursuing technical studies. 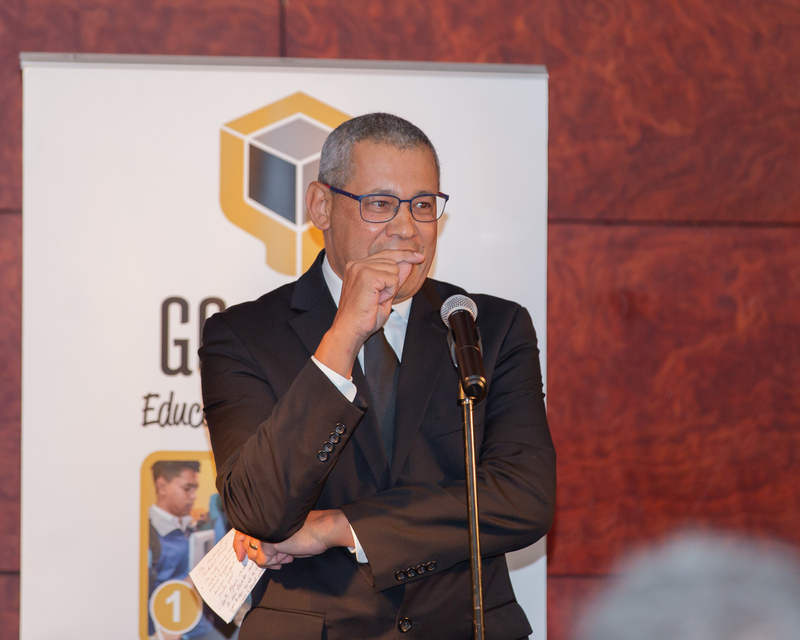 Go for Gold intend to make the programme a national intervention because it supports 7 of the Africa Sustainable Development Goals and the model can be replicated in any industry requiring technical graduates.